British 78rpm record labels whose name begins with B. Using the letter links below you can see pages for other letters. 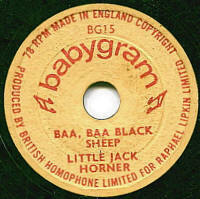 Babygram One of the smallest records ever produced, Babygram records were just 4" in diameter and single-sided. They are made of a vinyl-like material by British Homophone for Raphael Lipkin, director of Pippin Toys of London SW8. They were certainly available in the mid-1960s, so it seems most likely that they date from the first half of the 1960s. 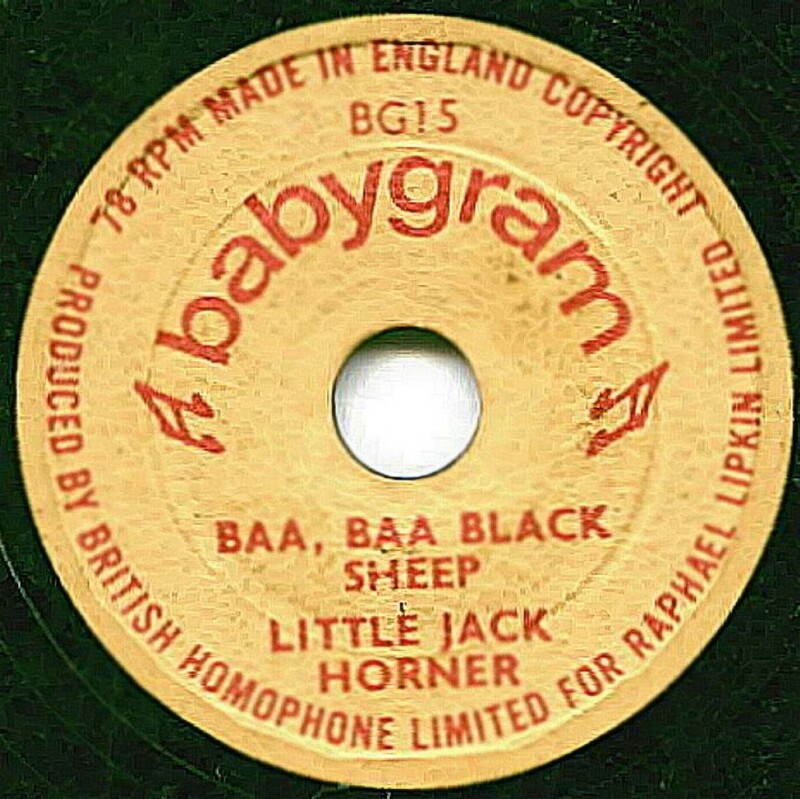 There was a corresponding tiny gramophone to play them on, also called "The Babygram" which had a red lid with "Babygram" in white lettering on it. Thanks to Lester Smith for the label scan and to Pat Malham and Gene Robertson for the extra information and details. Baby Odeon In early 1915, Odeon issued 6 double-sided 5" records labelled as "Baby Odeon" which contained music of a patriotic nature. These cost 6d each and were recorded by Beka/Lindstrom in London. The labels are either dark blue or a deep yellow (see image). 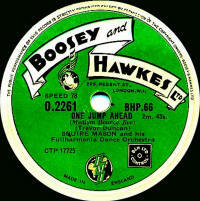 My thanks to Grahame Meachen for bringing these to my attention and for letting me have the record shown in the image. 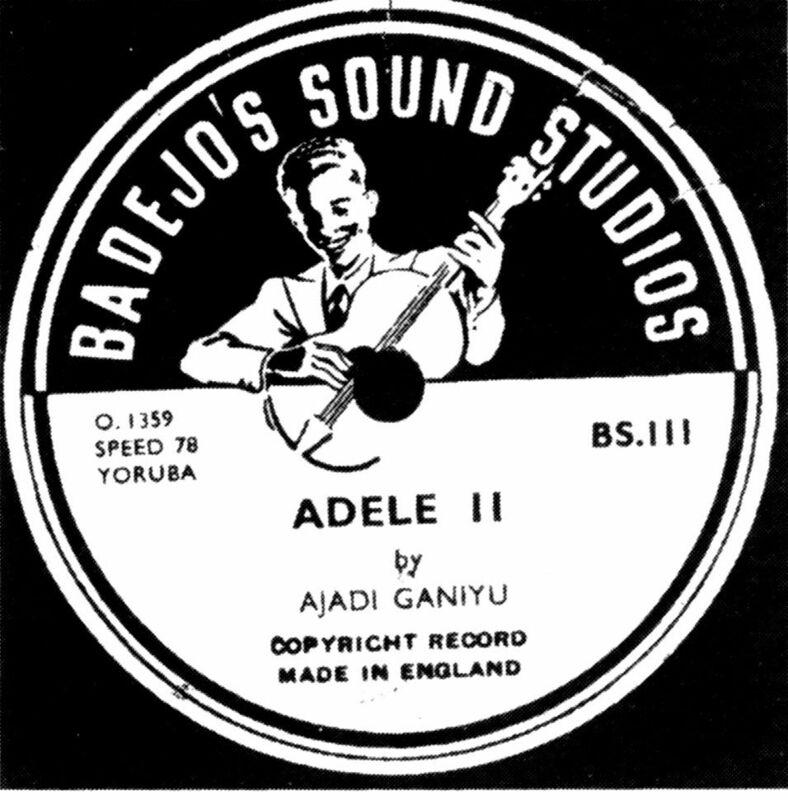 Badejo From the image (which is all I have), I would guess these were recorded by Oriole for export. Any more information gratefull received! Balisier My guess is that this dates to the post WWII period. 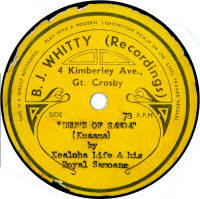 According to the label, the recordings were made in Trinidad and the records pressed in England. 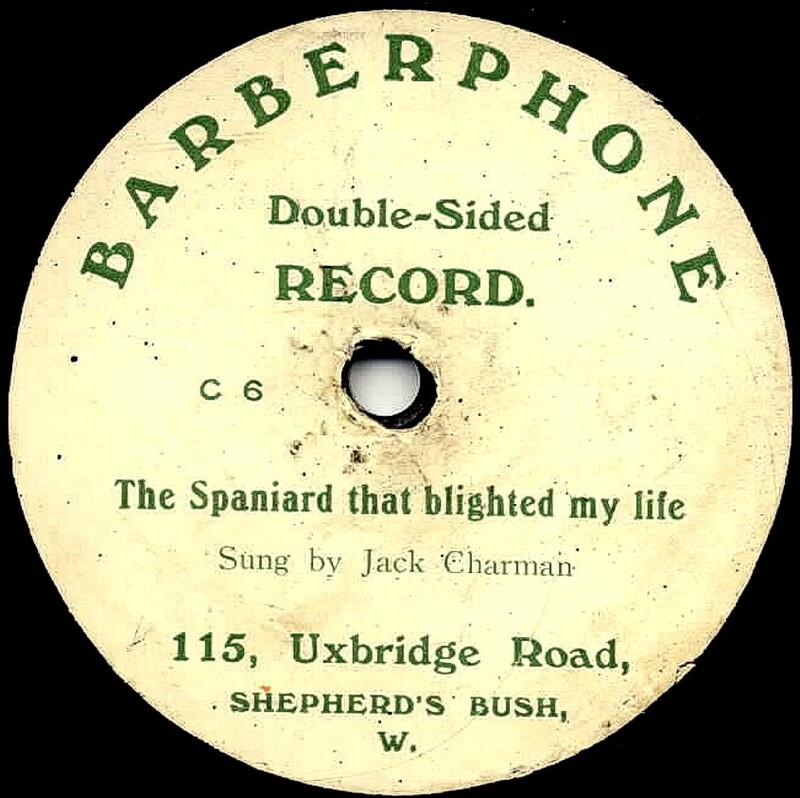 Barberphone Sold by Walter Barber & Co , of 115, Uxbridge Road, Shepherd's Bush, London, there were two types of Barberphone record, both dating from pre-1920. The first used J. Blum & Co's matrices and the catalogue was in a 1000 and 2000 series. 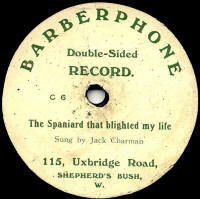 The other Barberphone records are paste-over labels on Grammavox and Popular records. Thanks to Rainer Lotz for label scan. 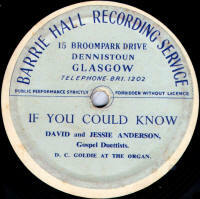 Barrie Hall A private recording company based in Glasgow. 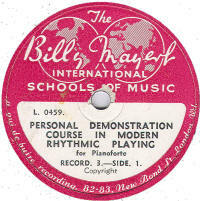 This example is a properly pressed record, rather than an acetate. BBS This is a regional record company, but is difficult to date despite having this example here to hand. I'd guess it dates from post WWII. The company is/was based in Solihull, Warwickshire, but I don't know what "BBS" actually stands for. 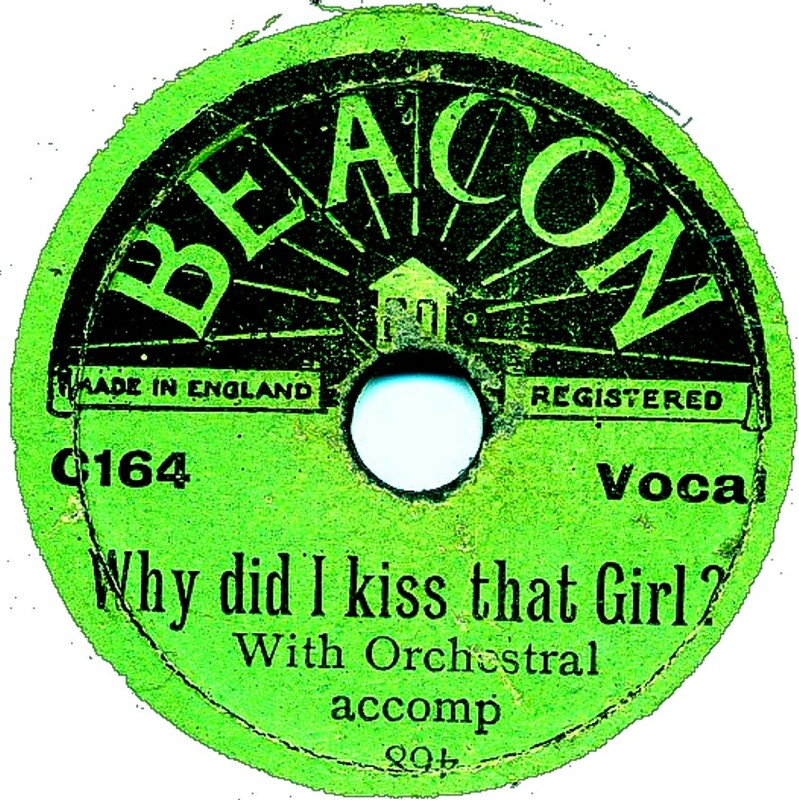 Beacon A sister label to Mimosa, though very much rarer, Beacon was a 5½" disc produced by Crystalate from recording made by the Sound ecording Company in the early 1920s. The catalogue numbers are in a B-500 or C-100 series, but the extent of the series, and exact period the label was available (and for whom it was produced) is not currently known. 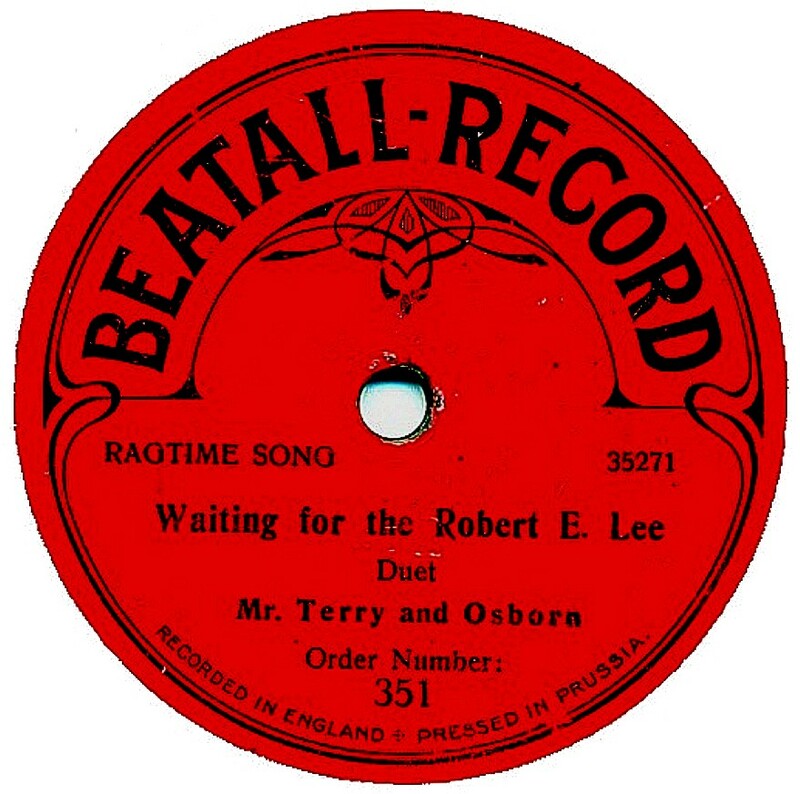 Beatall Beatall records made a brief appearance in 1910 with a very optimistic name that didn't really live up to expectations. 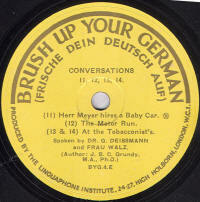 As with many records of this period, they were pressed in Germany, possibly from Operaphone (and other) masters. It is understood that the proprietor was a dealer by the name of Lloyd Thomas. Beka Beka records were originally the product of Bumb & König, a German company who had been involved with the German side of International Zonophone. 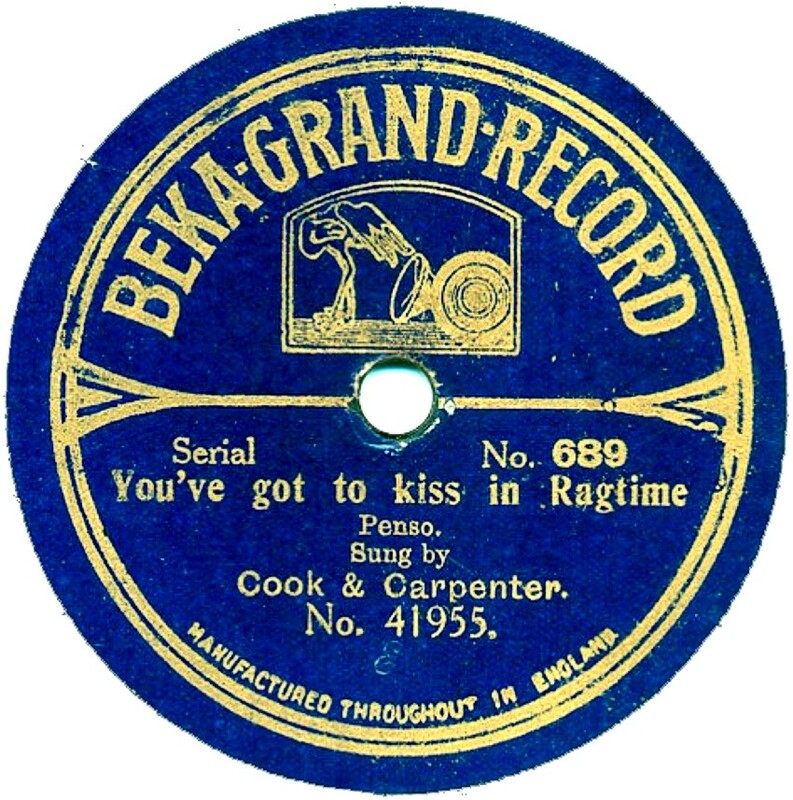 When The Gramophone Company bought Zonophone in June 1903, in order to eliminate some of the competition, Bumb & König decided to introduce their own record label and named it the Beka Record (pronounced "Bay-Kah", which is the German phonetic pronunciation of the company's initials). This was in March 1904. 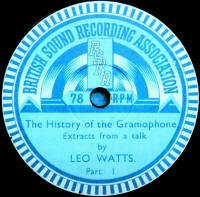 The following year, in September, Beka sent recording engineers to London to record matrices there. The exact location of the recording rooms are not known at present, but were believed to be in Islington, London. 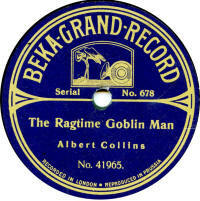 The first advertisement of Beka records for sale in Britiain was in November 1905. They would have been 8" records, and possibly both single & double sided were available. 11" Beka Symphonie single sided (3/-) and double sided (4/3). 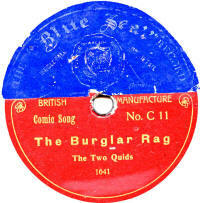 None of the double-sided records had "catalogue" numbers, i.e.numbers common to both sides. 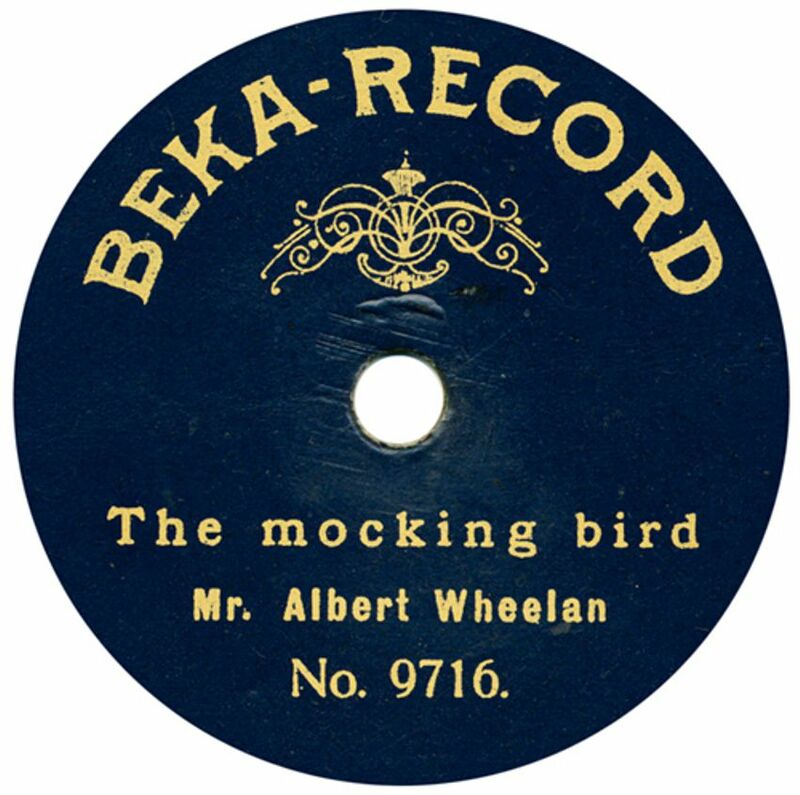 By the following year, in April 1906, they had added a 7" Beka Record at 1/- (single sided) or 1/6 (double sided). The other styles were reduced slightly in price so that the 8" were now 1/3 and 1/10; the 10" 2/- and 3/-, the 11" 2/6 and 3/9. 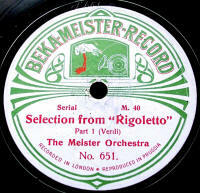 In January 1907 Beka Meister records became available in Britain. These were 12" records, double-sided, selling for 6/6 each. 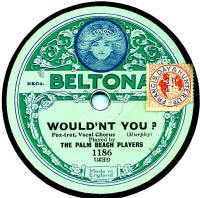 Up to this point, Beka were using a common series of master numbers for all sizes and recording venues, but in May 1907 they introduced different series depending on the place of recording and, in some cases, on the record size. Hence the British masters were allocated a 40000- series, which was mainly used on the 10" Beka Grand records, but also on the 12" Beka Meister records; the numbers were prefixed G for 10" and M for 12". (I don't know about the 7" & 8" records). Catalogue numbers common to both sides were still not being used. In September 1908, the London office of the Beka agency of Otto Ruhl Ltd moved to bigger premises at 77 City Road London E.C.. This was a four-story building with the recording rooms on the top floor. 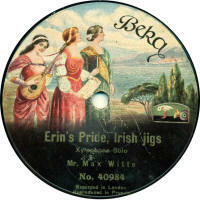 It was in October 1909 when the company started issuing records with catalogue numbers common to both sides. 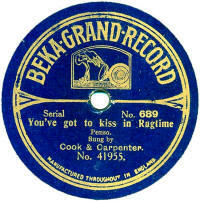 The first Beka Grand record so numbered was No. 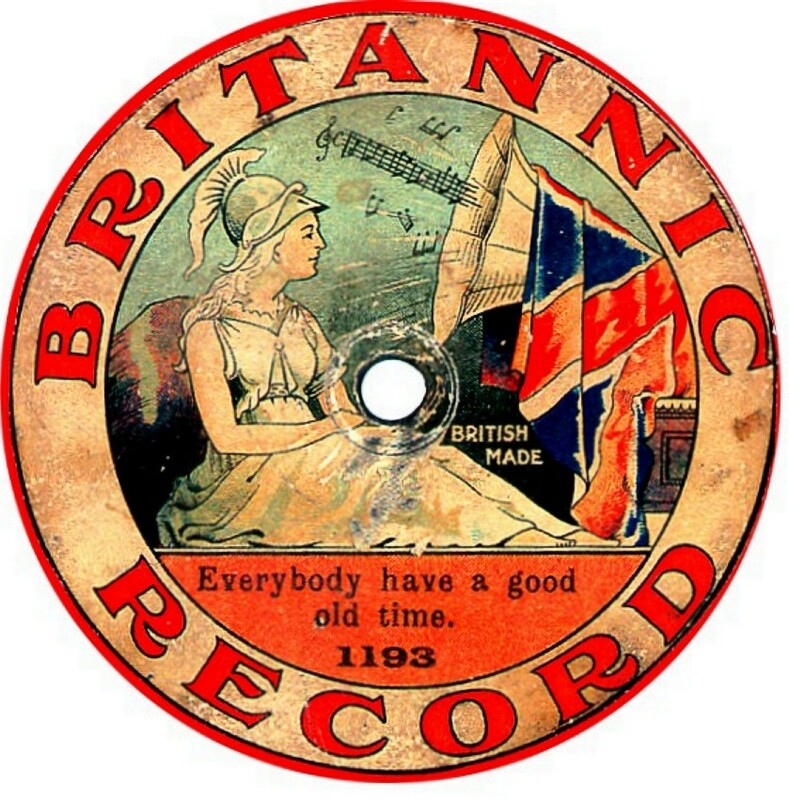 216 and all the previously issued records in the catalogue were given numbers from 1 to 215. In August 1910, the Beka business was bought out by Carl Lindström AG; the highest pre-Lindström issues being Beka-Grand 322 and Beka-Meister M25. Linsdström immediately dropped the other sizes (in fact they may already have been discontinued by this time, though it is known that some of the early 8" Beka records had already been doubled-up with catalogue numbers of X-1 to X-27). It is likely that with the acquisition of the company by Lindström, the labels were redesigned to the more familiar styles including the logo of the stork-and-horn and the place of manufacture. 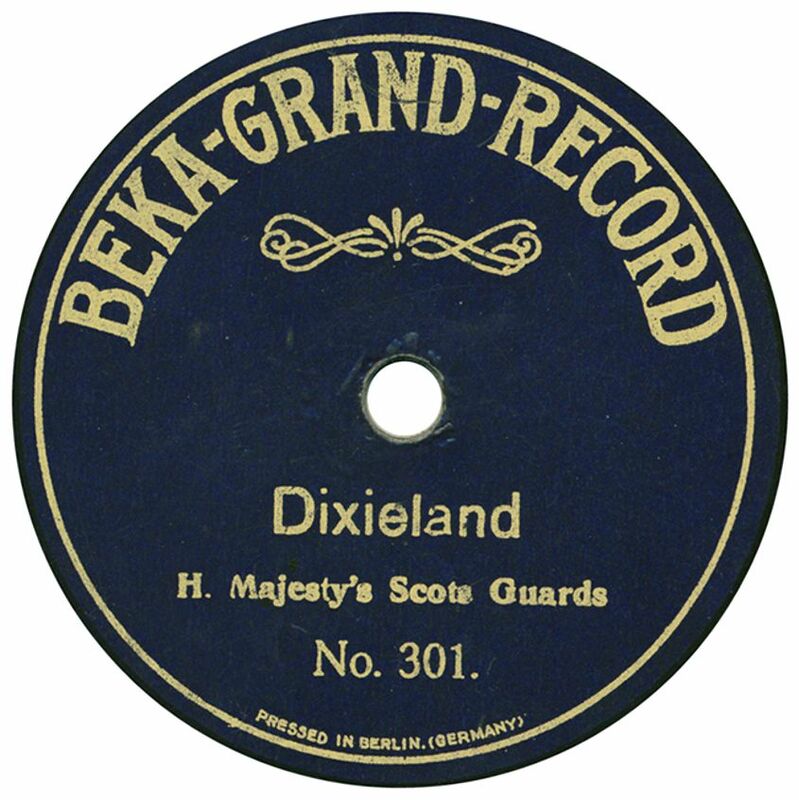 By October 1911, the British Beka-Meister masters were being numbered in a 9000 series, leaving the 40000 range for the 10" Beka-Grand only. In the Spring of 1912, the 40000 London master numbers reached 41999 and the company started a new series at 35000, which continued in use until about 1919 by which time they had reached well into the 36000s. 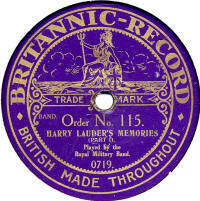 In late 1912, a British factory was being built for manufacturing Lindström-owned records, all of which had previously been manufactured in Germany. It was called The Mead Works, and was in Gas House Lane, Hertford and it opened in December 1912. By the time it was fully operational in March 1913, they report making 50,000 records a day (oh, yeah?). These would include not only Lindström's Beka, Coliseum & Scala records, but also Fonotipia's Jumbo and Odeon records, as Lindström had taken over the Fonitipia concern by this time. 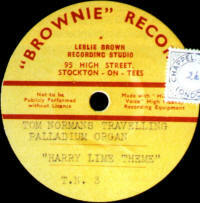 Despite the new factory in England, many Lindström-owned records were still made in Germany, where employment costs were lower. The outbreak of World War I had little effect initially on Lindström's London business, other than they could not longer get German-recorded masters, and had to make all of the records at Hertford, but in the summer of 1916, the Board of Trade started taking action under the new "Trading with the Enemy" acts to reorganise the company and turn it iinto a wholly-owned British Company. 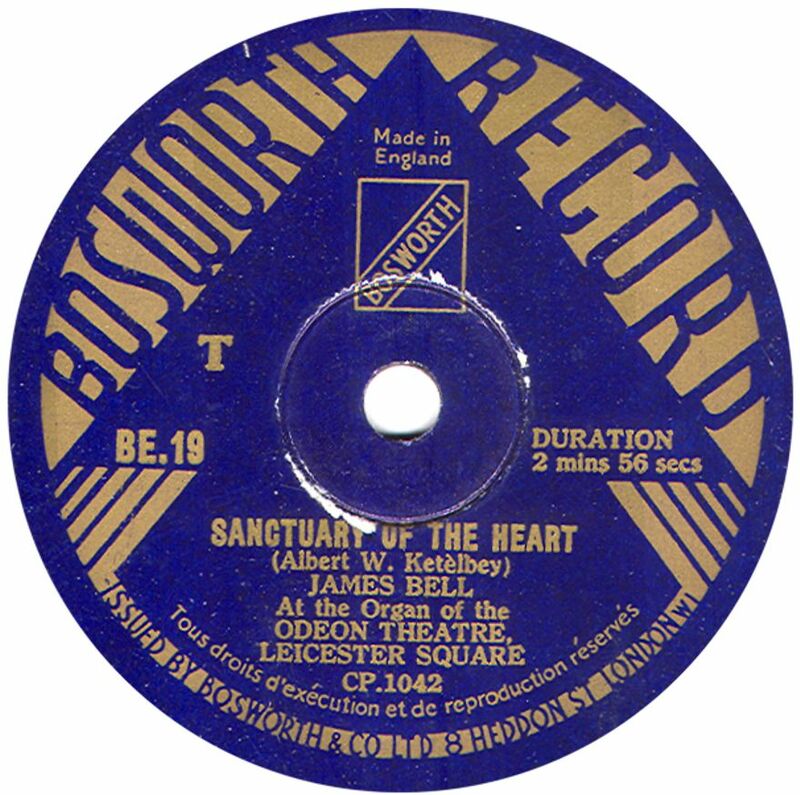 With financial capital from the newly-created Columbia Graphophone Company, Carl Linström Ltd was "ousted" and it became The Hertford Record Company (owned by Columbia), though the personnel in the factory apparently remained the same, with Otto Ruhl on the management team. 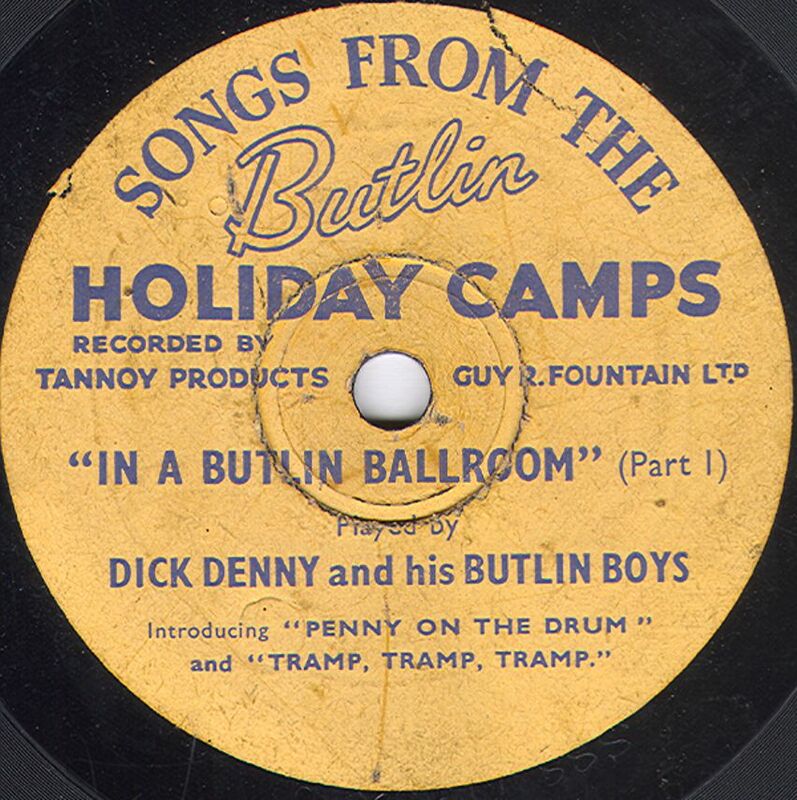 It was at this point that the Beka name on records was dropped due to its German associations, and the Jumbo records were renamed "Venus". 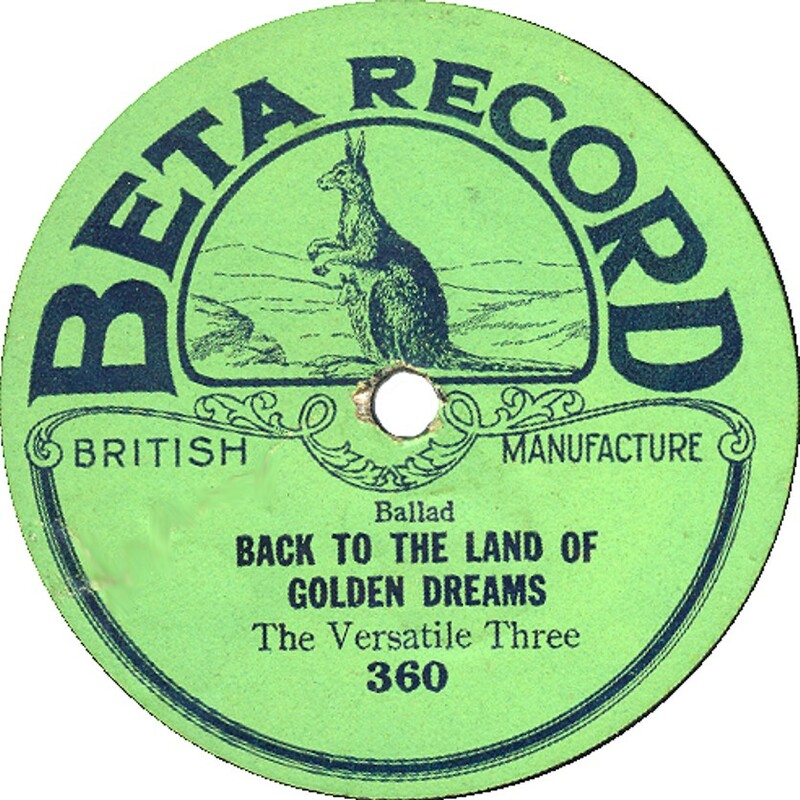 One of the UK directors, Otto Heinemann, had left Britain in 1914 to start a new record company in America, which later issued the famous Okeh records. A postscript to this story is that in the early 1920s a UK Beka catalogue was produced. 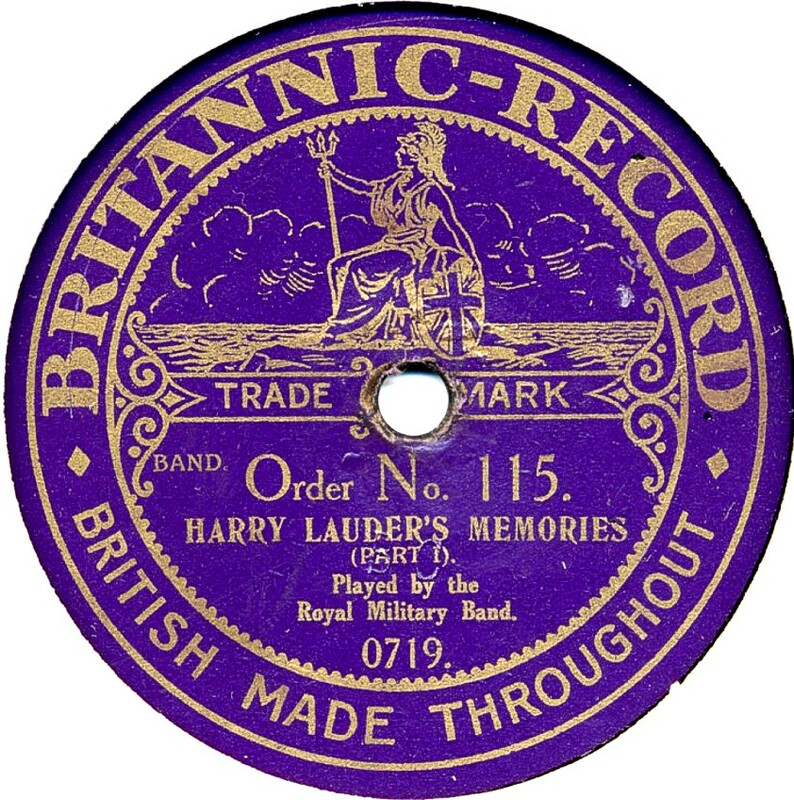 It was undated but may have come from Otto Ruhl (1922) Ltd and could have just pre-dated the reappearance of Lindström-owned records with the new Parlophone Label in Auntumn of 1923. 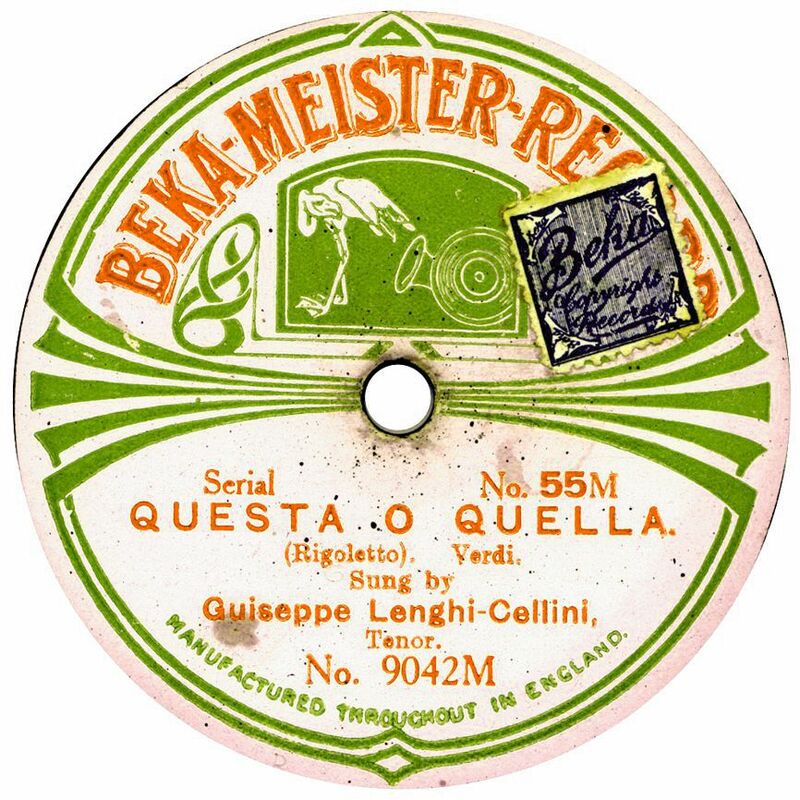 This Beka catalogue contained no new UK recordings, but consisted mainly of German masters dating from the outbreak of WWI up to about 1920, issued on Beka (10") and Beka Meister (12") records. I am very grateful for the research done over the years by Frank Andrews and Bill Dean-Myatt which has enabled me to produce the above narrative. Frank and Bill's full story of Beka/Lindstrom can be read in a booklet produced by the CLPGS (Reference Series RS11), which also includes a full listing of known issues on a data CD. 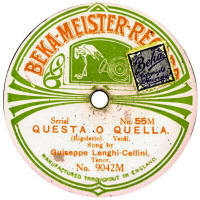 The earliest Beka records all have quite a plain label and it may be that this plain design only changes following Lindstrom's takeover in 1910. This is only my opinion, and until I find out (or someone convinces me) otherwise, that is what I am assuming, even though the flamingo-and-horn trademark was used in adverts quite early on, it seems to have not appeared on the record labels until later. 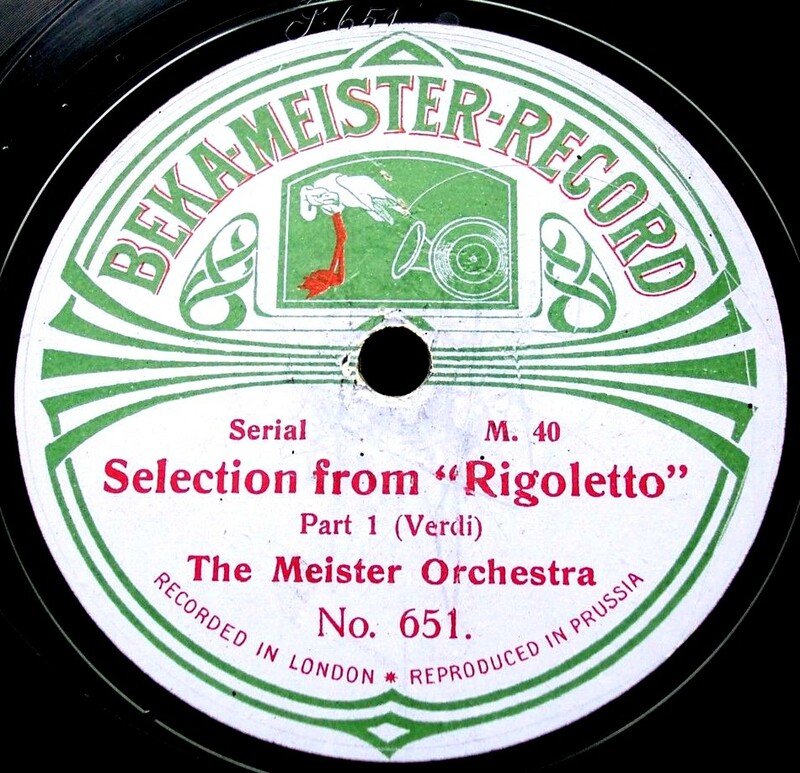 I have not seen any images of a 7" Beka Record, nor of an 11" Beka Symphonie and, assuming the early (pre-Lindstrom) Beka Meisters had a different design from those shown, I've not seen any of those either. Beka Grand with Cat No. (courtesy of Norman Field). Bel Canto A very attractive pre-WWI label, the company was established in Germany in 1909, but in 1911 J.G. 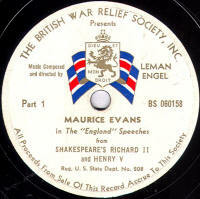 Murdoch started importing the records into England. 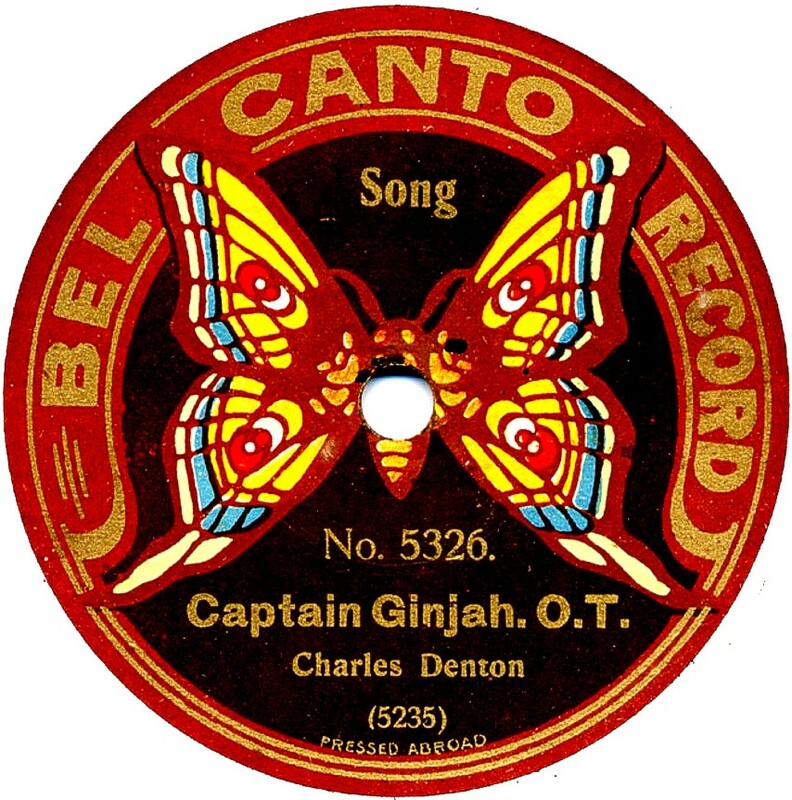 Bel Canto recorded their own masters, but the label, which is fairly scarce, also used other company's masters, including, apparently Dacapo and some made specifically for Murdoch. 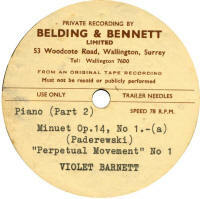 Belding & Bennett A private recording company based in Surrey. This example looks to be an acetate. 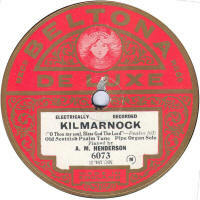 Bell Disc Bell was the name given to Edison Bell's first disc records in 1908. 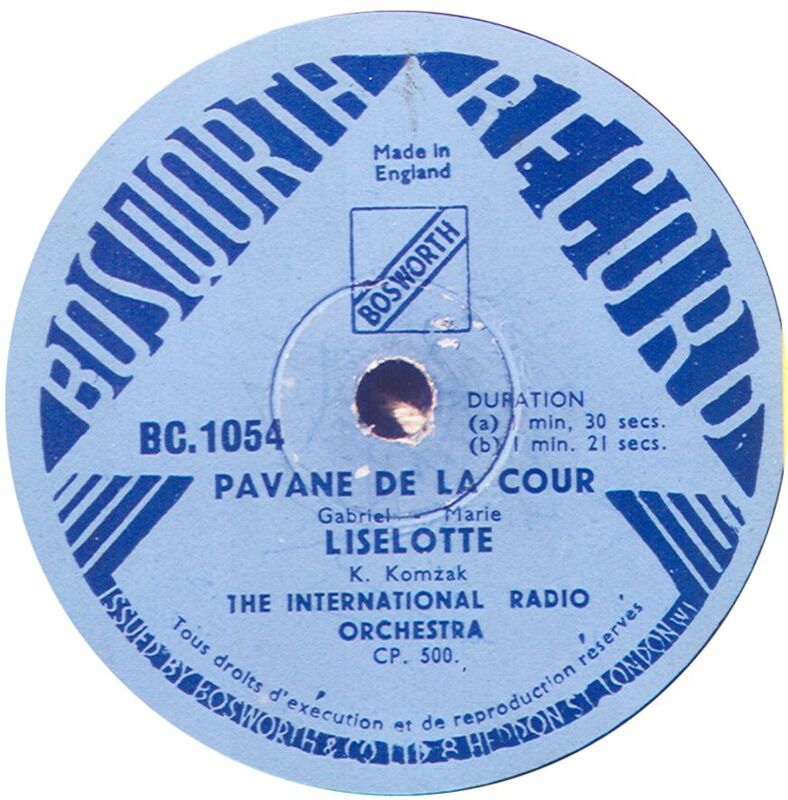 Although advertised as "Discaphone" after the company's disc player, the labels never used the name. They were originally 10½" in size but later settled down to the more usual 10". They cost 2/6 and the catalogue number started at 1, reaching about 500 by 1912 when the label was discontinued and replaced by Winner. In the 1920s, Edison Bell revived the Bell name for their 5½" (later 6") children's label. Catalogue numbers started at 250 in 1921 and the label survived until 1926 by which time the numbers had reached into the 400s. An Export series using catalogue numbers starting at 700 was also produced, with many sides specially recorded for France or Belgium. 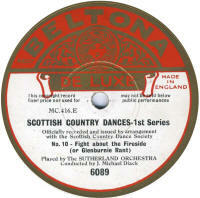 Dance band items specially recorded for the format may be found. 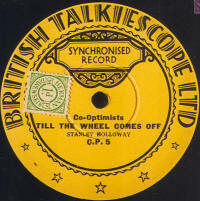 All issues are British recordings. 6" recordings continued to be issued after this time by Edison Bell, but were issued on the Crown label. Bell Accordion Dating from the mid-1950s, Bell Accordion records were produced by Phillips Electrical and Levy's (Oriole) and, not surprisingly, concentrated on accordion recordings. 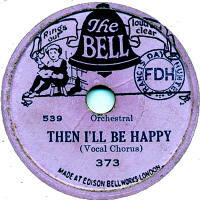 The propriertor was Arthur Bell & his company Bell Accordions Ltd of Surbiton, Surrey. Bellaphone It is not certain that these records ever made it onto the market. 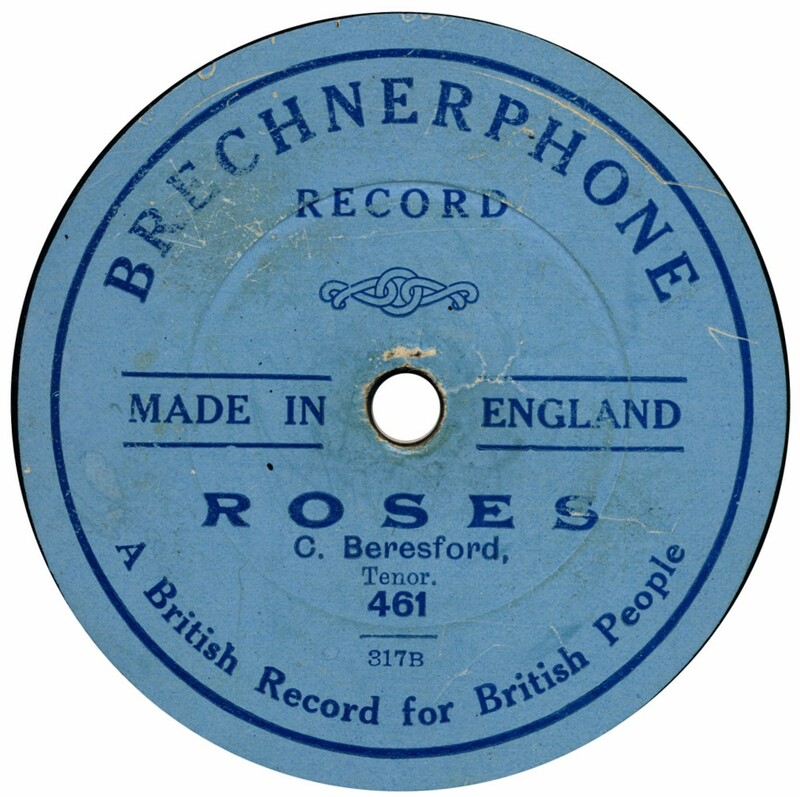 They were advertised in March 1920 by the Bellaphone Company of 10, Brook Green, Hammersmith, London, but none have ever been reported, though they were being advertised at the BIF (British Industries Fair) in 1920. Please e-mail me with details of ANY of these records. Also a label scan. 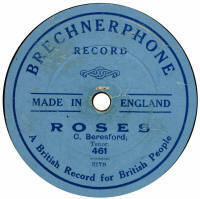 Bellerophone A German-produced record, allegedly marketed in Britain prior to WWI, using Kalliope masters. 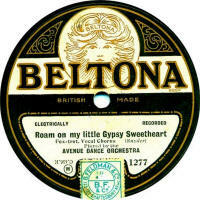 Beltona records were produced for the Murdoch Trading company of 59-61 Clerkenwell Road, London, EC1. It was 1922 before the label was revived and the pressings were taken on by Vocalion and they used their usual masters from their own recordings and from American Gennett and Vocalion. The familiar design (see third picture) was used, though initially the colours were red and buff (see second picture) rather than turquoise and light turquoise. 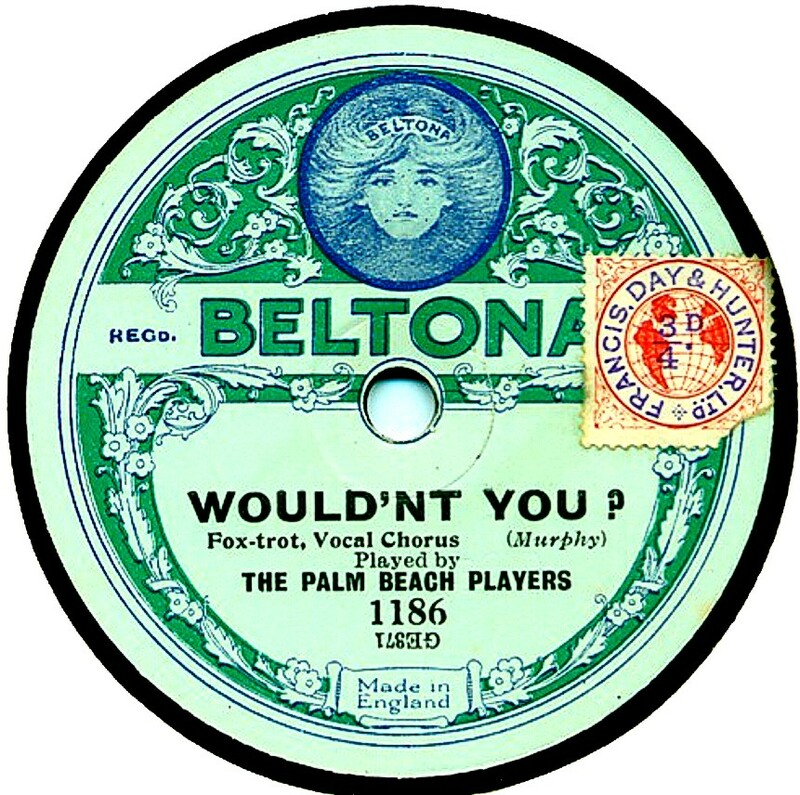 There was also a 6" disc called Beltona Bairns produced by Vocalion at this time; the photo reproduced here shows one in its original packet. 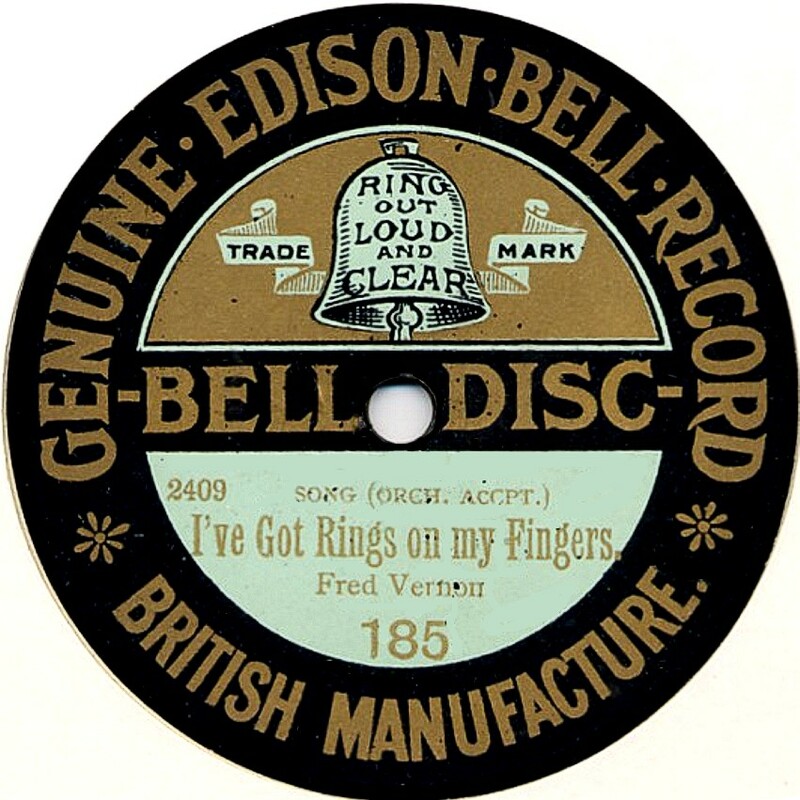 In 1927, the label design changed to the black and white design shown here and soon after this, Edison Bell started providing the masters as Vocalion ceased any 10" recordings. 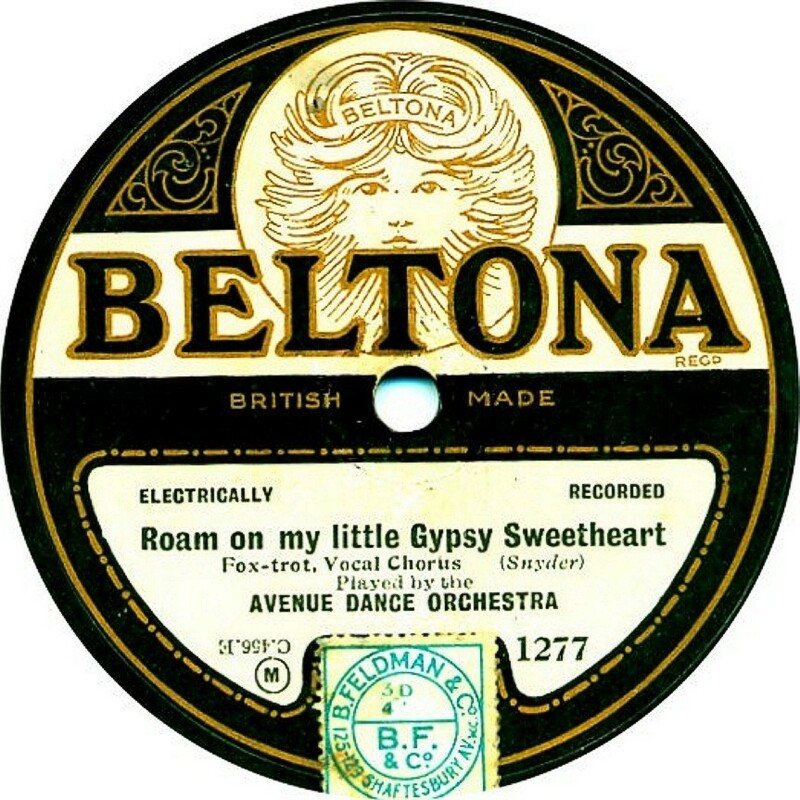 By the following year, Beltona seemed to stop issuing dance music, though in the early 1930s, a few sessions of local dance bands were recorded (see scan). 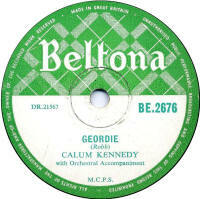 The label concentrated on Scottish and Irish music for the rest of its life and carried on into the 1970s, though obviously was by then in the 45rpm format. The catalogue numbers started at 101 (for popular records) and reached about 1250 before the design change and Edison took over from about 1300. The label generally shows the correct matrix number, even though the original matrix has been expunged from the disc on many of the American matrices. 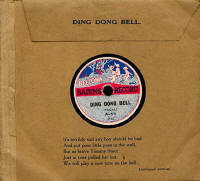 The Bairns records used a 3-digit series of numbering. NOTE: There were many other issues and series and a full listing of all Beltona issues was produced in 2007 by Bill Dean Myatt. 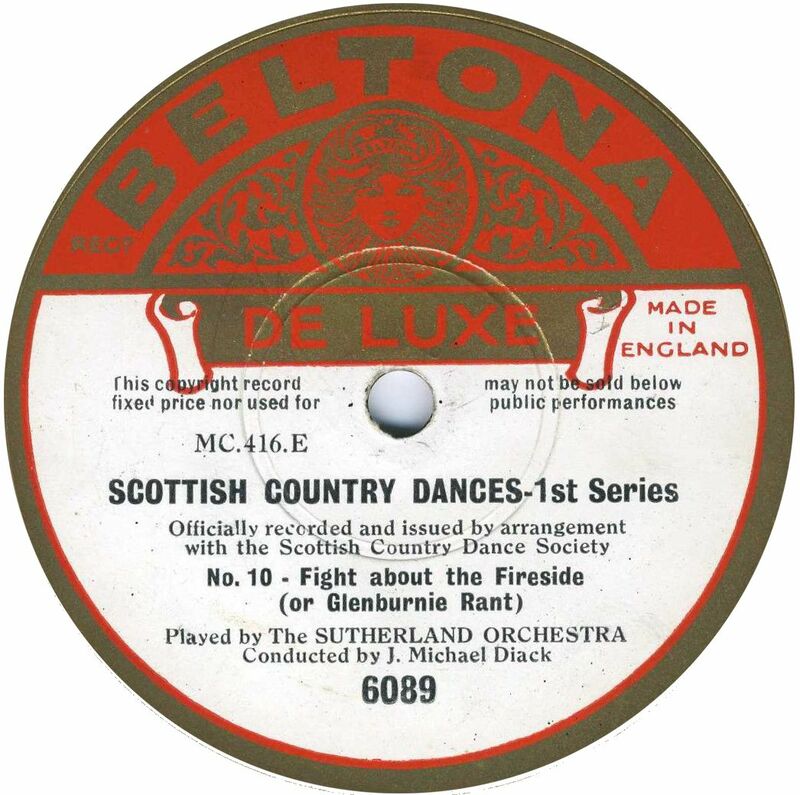 A new edition of Bill's Beltona listing, with many amendments and including recording dates is now available in the Reference series. The booklet, at a very reasonable price has the full history and a CD with the catalogue listing which is fully searchable. This is available from the CLPGS. 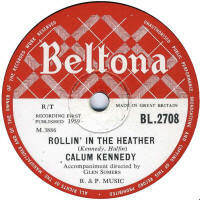 Below the Belton Bairns record are some of the later label designs, courtesy of Ivan Ruddock. Berliner Emile Berliner was the inventor of the disc recording in the 1890s. 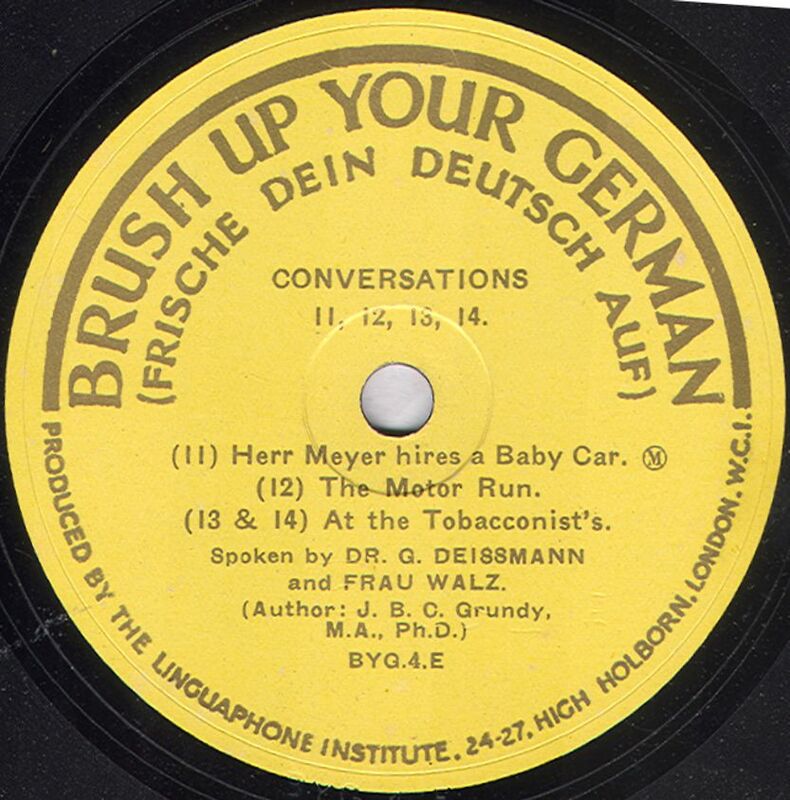 His earliest records are now generally referred to as "Berliners", but more properly are Gramophones. 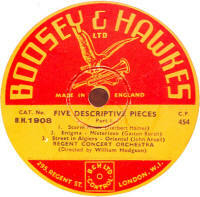 They were 7" in diameter, single-faced and the information was inscribed into the centre of the disc. 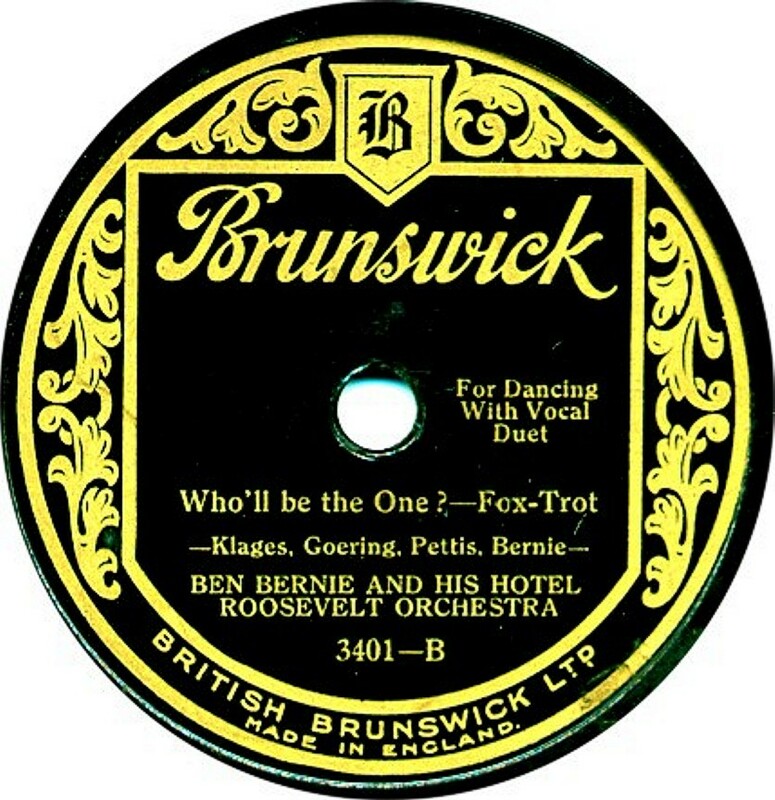 In 1901, the company introduced 10" records which were briefly still called "Berliner" but with the titling embossed in a typeface (see second image - thanks to Bob Lilley for this photo), but then printed labels were introduced and soon after, Berliner's name was dropped in favour of The Gramophone Company's name. 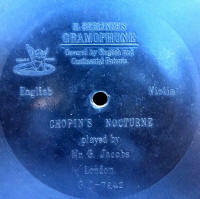 At some point the term "Gramophone" became applied to the playing machines rather than the records. 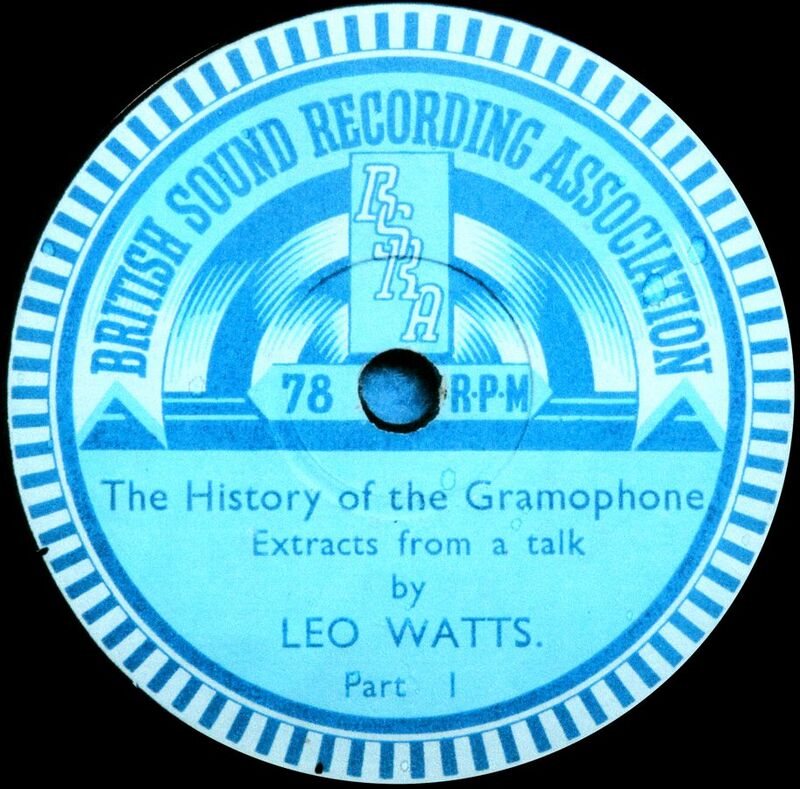 Berliner's company, based in England was known as The Gramophone Company and became well-known since for their "His Master's Voice" records. 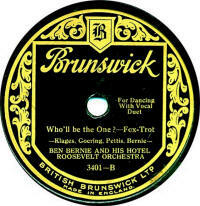 Berners Music Company This record was pressed by Parlophone in the 1920s for Berners Music Company. 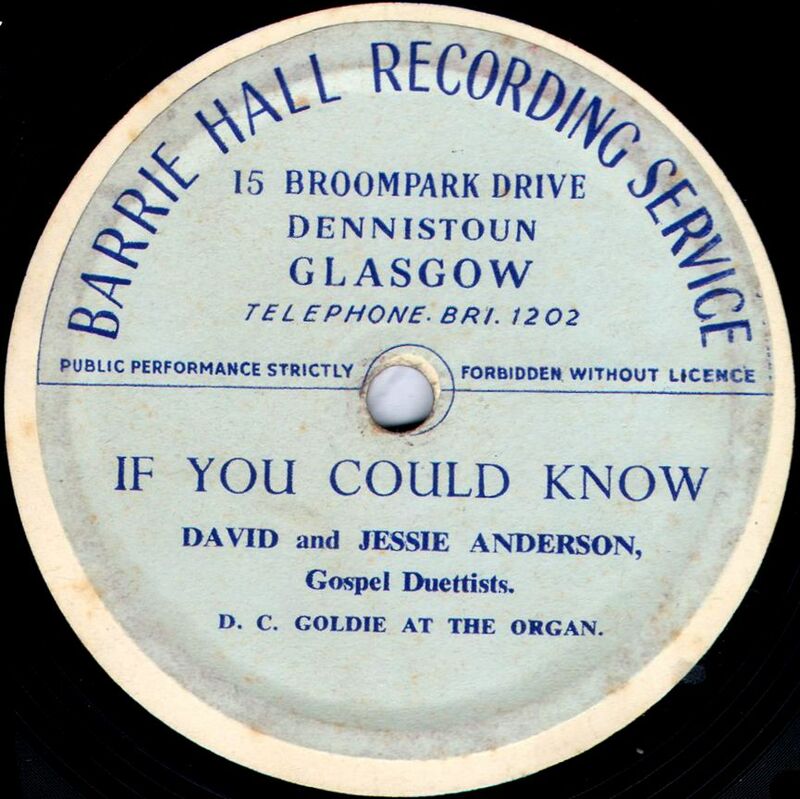 This may be a one-off, as no others have been reported, and it has no catalogue number, just side numbers, which are actually Parlophone master numbers. 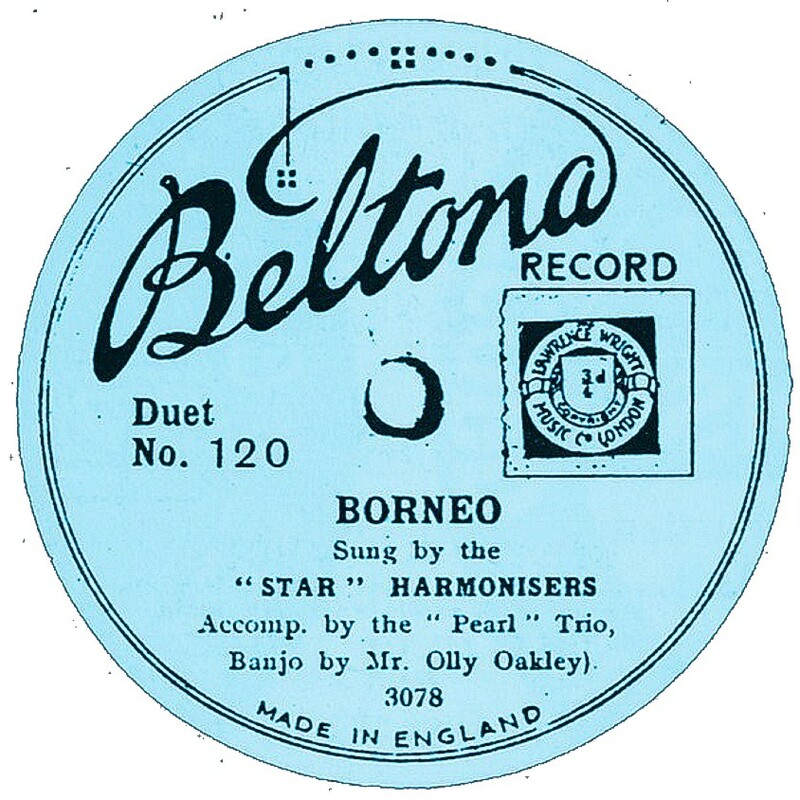 Besttone Besttone records were available in between 1912 and 1916 and could be bought from the Regent Wave Company of 120 Old Street, London, owned by Leon Liebowich. On this label may be seen the name "Rifanco Eagle". It is not known what Rifanco means or refers to, but the needles and gramophones available from Regent use the name too. Other label designs show the Rifanco Canary, Rifanco Marble and Rifanco Lion, as well as just Rifanco Brand. 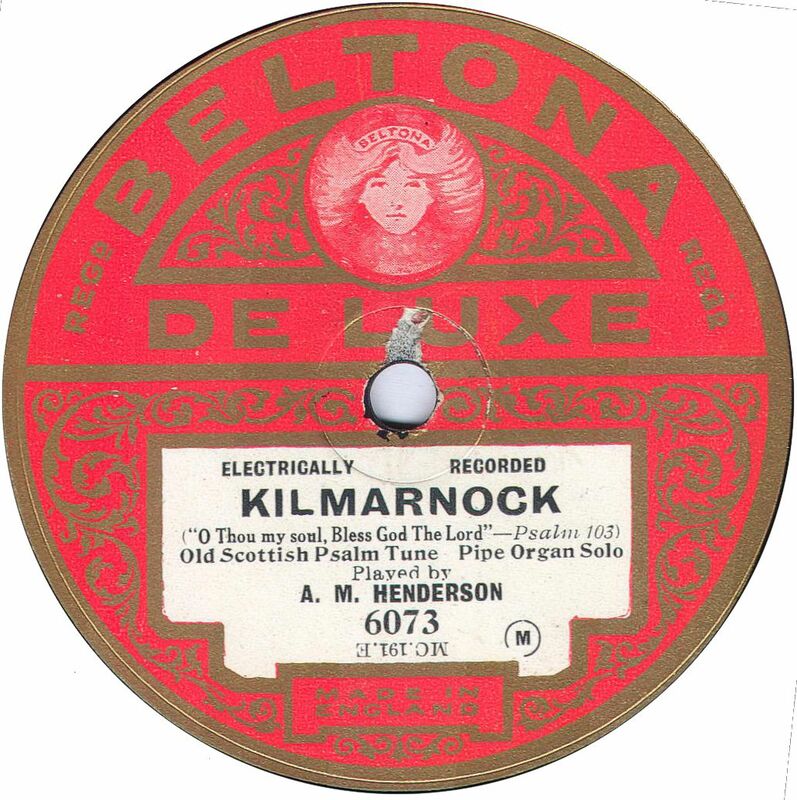 The Besttone name was also used by the company as paste-over stickers on other record labels These were old stock sold by Regent; known examples are records previously sold by J. Blum & Co., such as Diploma & Pelican (see last two images here), following the liquidation of Blum & Co. in July 1915. 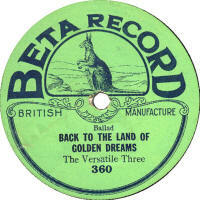 (sold in Australia) This was a paste-over label available in Australia during 1918-21. The original records are believed to all be Edison Bell Winners. The catalogue numbers matched the Winners to start with and then the first digit was dropped off the original Winner number. Thanks to Derek Kell and Rainer Lotz for the label scans. Bettini This was a French company (actually called "Société des Phongraphes, Bettini") formed in 1901 by Gianni Bettini, along with some wealthy investors. Initially it was planned that Nicole Freres would press records for Bettini, but the price for doing this could never be agreed upon. 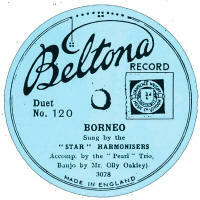 In early 1904, some French disc recordings by the Bettini Company were manufactured in England, but by Crystalate at Tonbridge, Kent. Any information, or images of examples of such records would be appreciated! 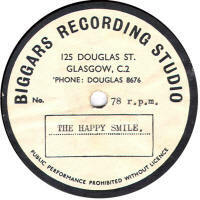 Biggars A private recording company based in Glasgow. 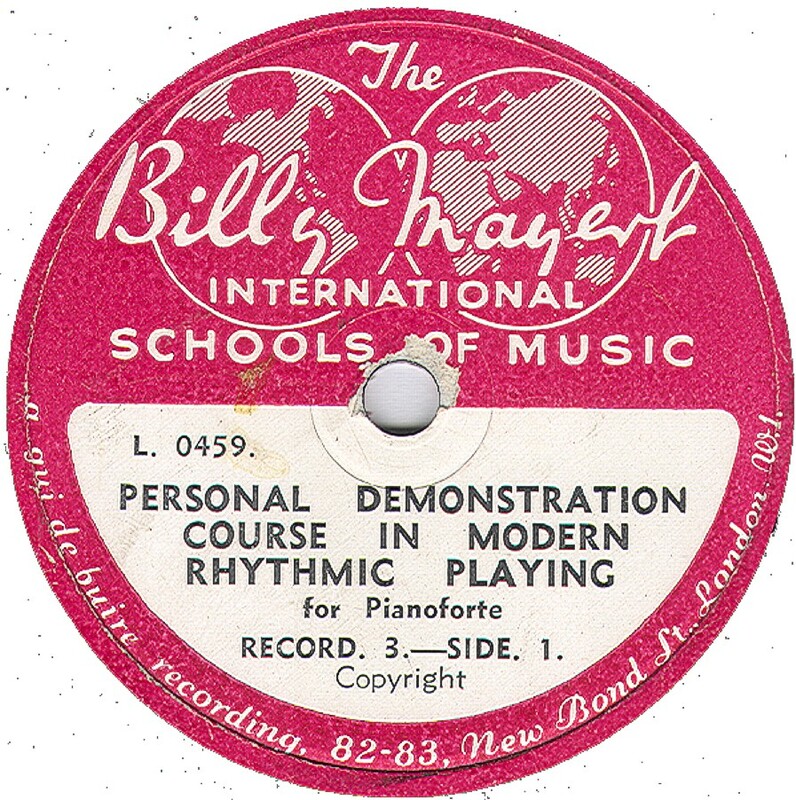 Billy Mayerl Billy Mayerl was a syncopated pianist and composer whose career dated back to the early 1920s (at least) when he playing in the Savoy Havana Band. The records which bear his name are part of a piano tuition course. 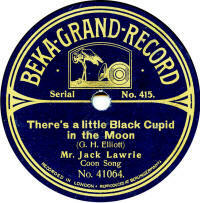 They were recorded & pressed by the Vocalion Gramophone Company and date to the late 1920s. 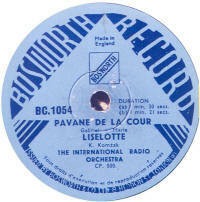 However, the examples shown here are post-WWII issues which state they are Gui de Buire recordings. Gui De Buire records are usually lacquer discs. 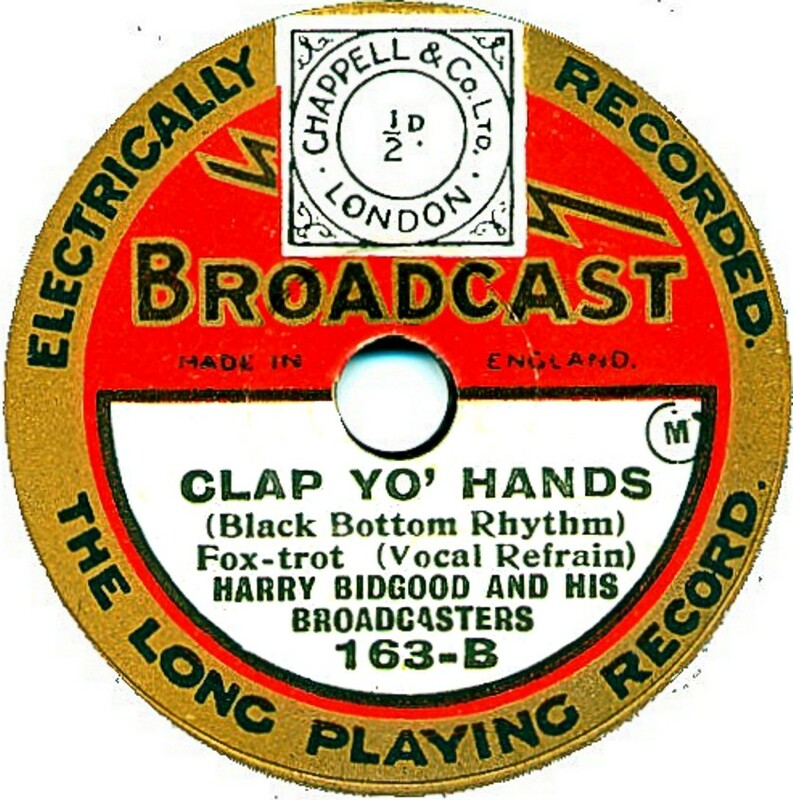 I have not been able to examime these, but they appear to be using original Vocalion master numbers.The original issues look very similar to the Broadcast 12 blue labelled issues from the late 1920s. Birmingham Sound Reproducers This looks like a privately produced record. 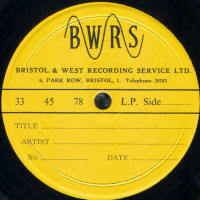 The company was based in Birmingham, England and better remembered nowadays as BSR for their record decks and other "hi-fi" equipment. 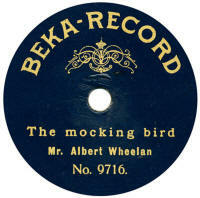 The record shown here is single-sided, pressed in standard shellac and a master from the original US Bluebird issue. Bishop Sound A private recording company based in London. 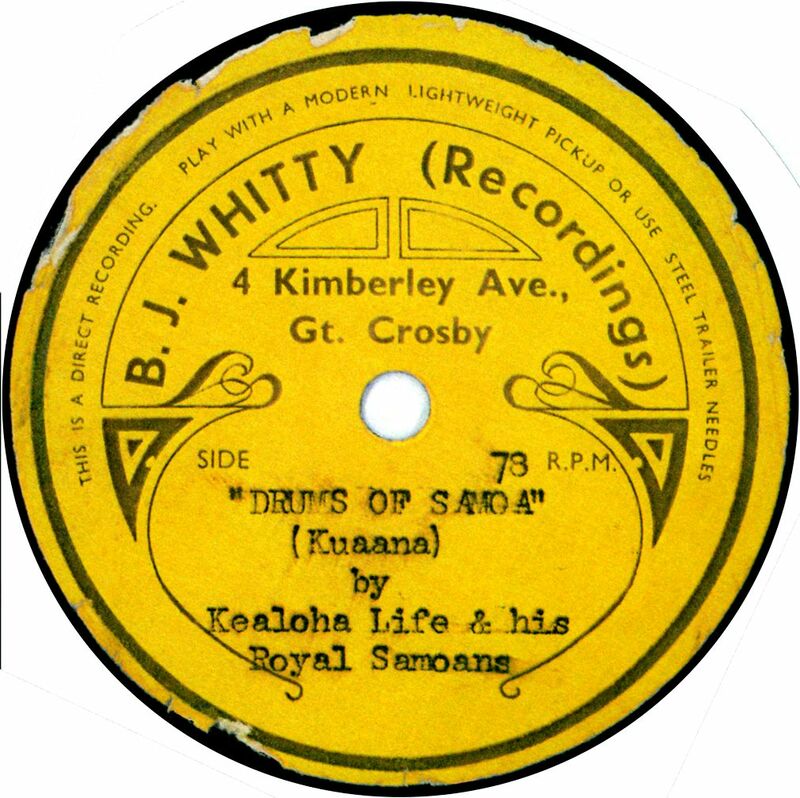 B J Whitty Thanks to Bill Dean-Myatt for the scan of the label. Black Diamond A British-made record for export to Australia, the Black Diamond record is extremely rare, and probably dates to WWI. It used Invicta masters, and therefore is presumably manufactured by Invicta as well. As far as I know, this is the only one seen, and it is catalogue number B1, so it may be the only issue! Blue Rhapsody A post-war label concentrating on religious material, produced for Marshall, Morgan & Scott of Grays Inn Road, London. It would appear these were produced by both EMI and Oriole records Ltd.
Blue Seal Blue Seal is a paste-over half-label which P.F. Wykes used as a way of selling old record stock in the period immediately after the outbreak of WWI. Wykes was a gramophone & record dealer whose shop was in The Arcade, Northampton. 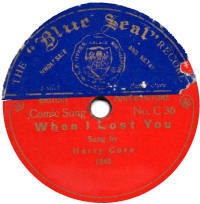 Examples of Blue Seal records seen have been Coliseum and Pioneer records and certain information at the foot of the label has been very carefully scrubbed out on the examples seen, in order to prevent indentification of the original label underneath. Thanks to Graham Farnell for the label scan. 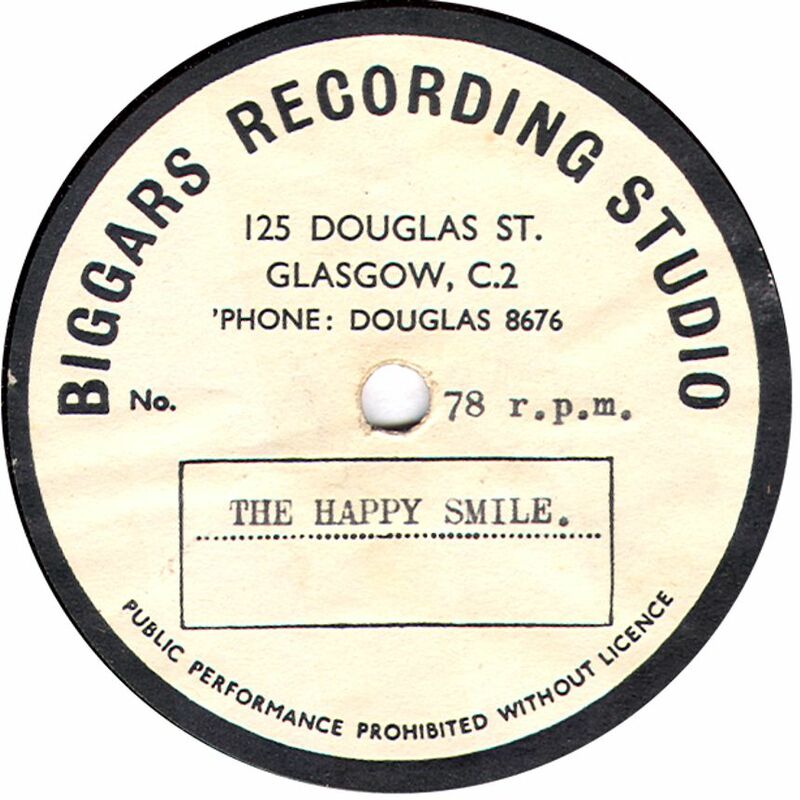 Bob A Scottish record company, based in Glasgow, Bob records feature the reverse side of a shilling piece (known as a "bob") in the label design. This reflected the price of the record at the time, 1/- (as mentioned at the foot of the label). The records were manufactured in Germany by the Berolina Company, from masters they were also using on their Invicta Record which was produced for the London agent, John Abrahams. The catalogue numbers matched those on the Invicta issues, but that doesn't necessarily mean that all Invictas were alsoi pressed up as Bob Records s well. Bob-o-Link These were 7" records sold in an album containing two records. First made in America in 1921, they were advertised in Britain from November 1922 as "talking books", for 6/- an album, sold through A.C. Gilbert Co. I don't know if the British-sold items were imports from the U.S., or manufacted in Britain, as I've never seen any examples. 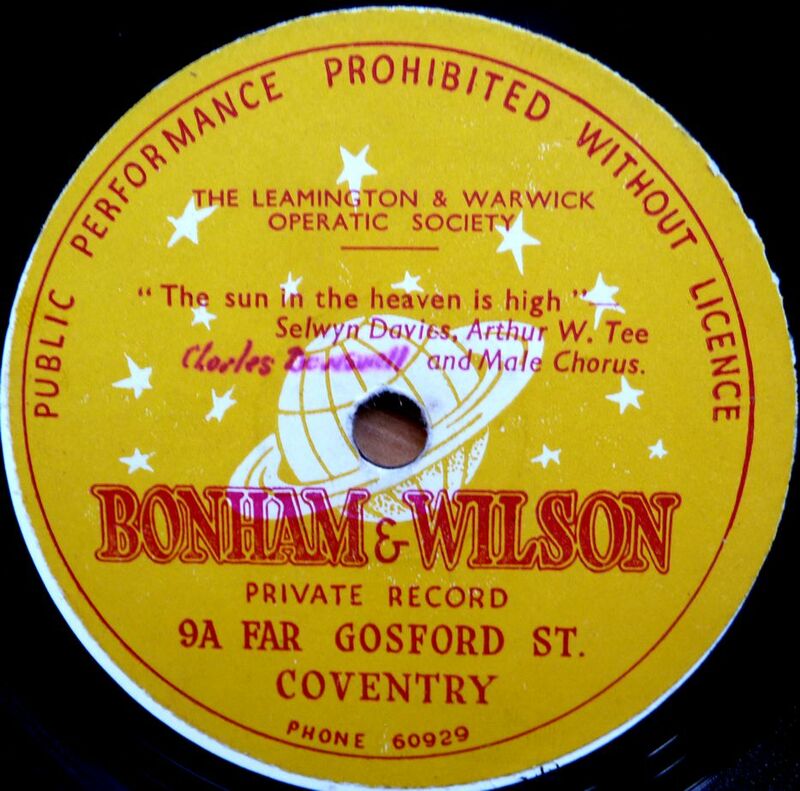 Bonham & Wilson A private recording company based in Coventry. 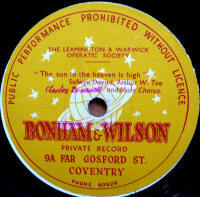 (sold in Australia) These records date from the mid-to-late-1920s were manufactured by Crystalate in England using their own Imperial masters, for export to Australia for sale in the Bon Marche department stores. 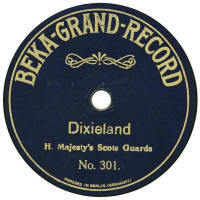 There were about 200 different records issued, in a 100-series catalogue. Thanks to Mike Jones for the label image. Bon Ton This consists of a sticker in orange with gold printing, pasted over Regal records dating from around WWI, probably as a means of selling off old stock. 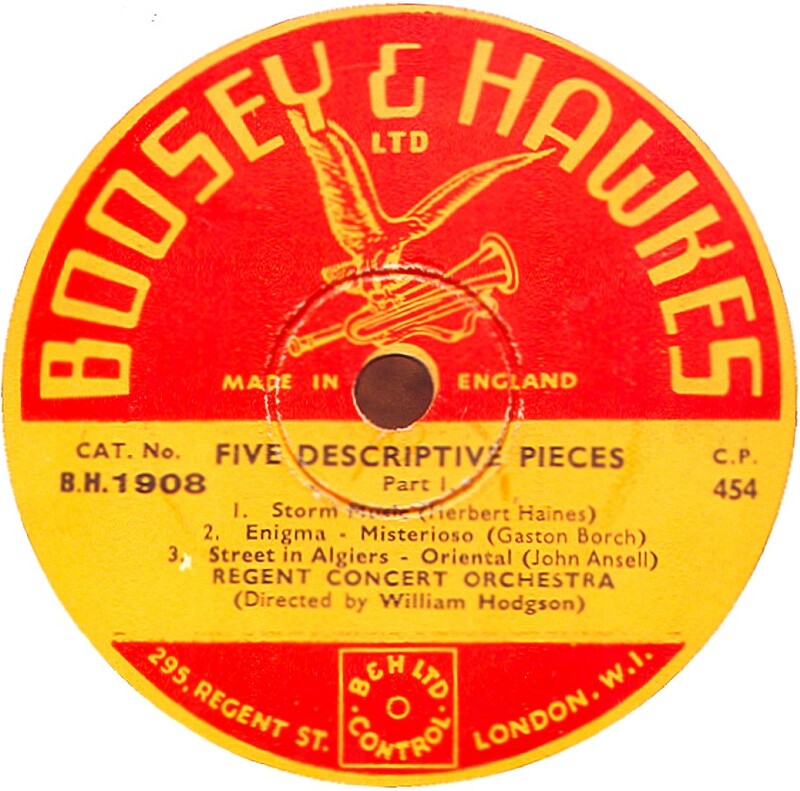 Boosey & Hawkes Boosey and Hawkes were a leading music publishers at 295 Regent Street, London. 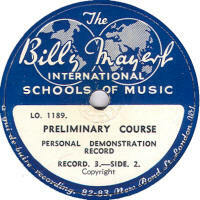 From 1937 until about 1967, B&H produced many records of 'music publisher' recordings in many different series. The first image here is a pre-war example; the master numbers imply a Decca product from the late 1930s. 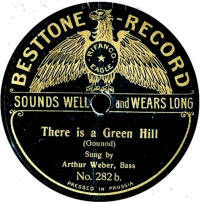 Subsequently, the more familiar green label-style (also seen with a red backgroumd) were produced by Levy's and then finally EMI. 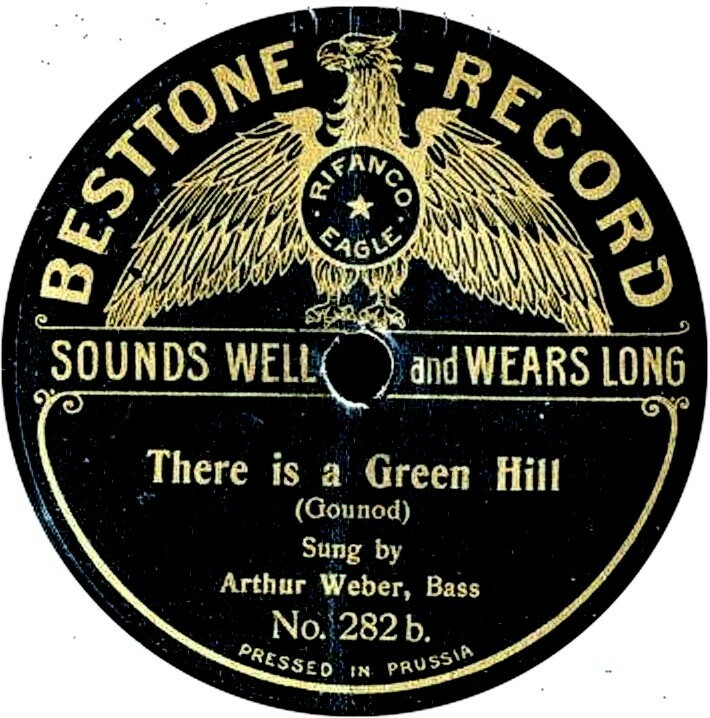 The later records, still 10" 78rpm, where pressed in vinyl and the label design was simplified, being green with black printing (no white). 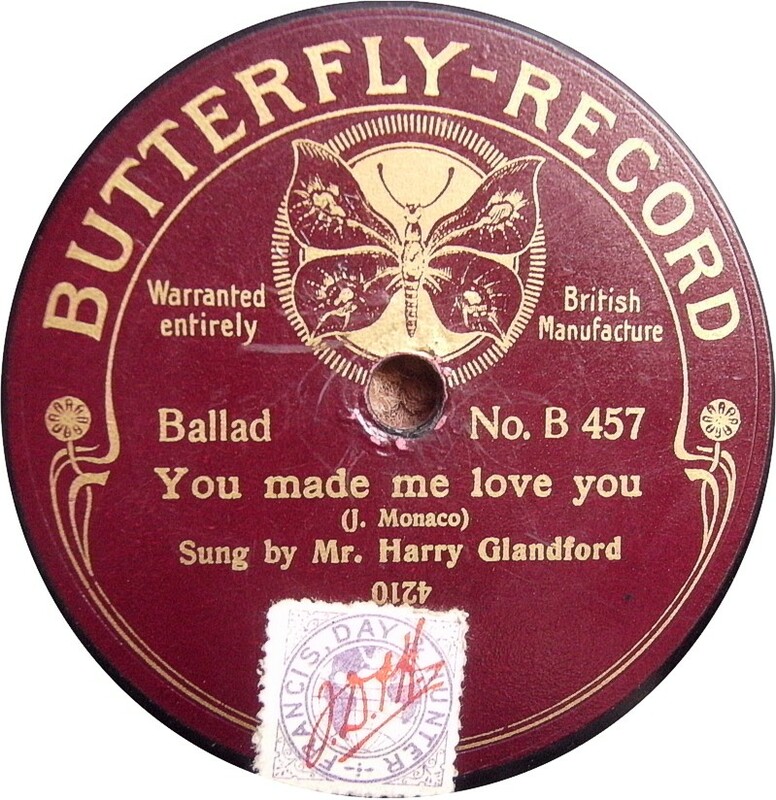 These, still as 78rpm discs, were produced up until 1968. 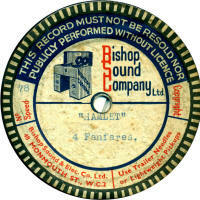 The last example shown is of a private pressing. Boots The well-known chemist chain (originally based in Nottingham) is not known for selling records these days. However, in the early 1920s, some shops at least (maybe only the bigger ones?) were selling their own-labelled record. 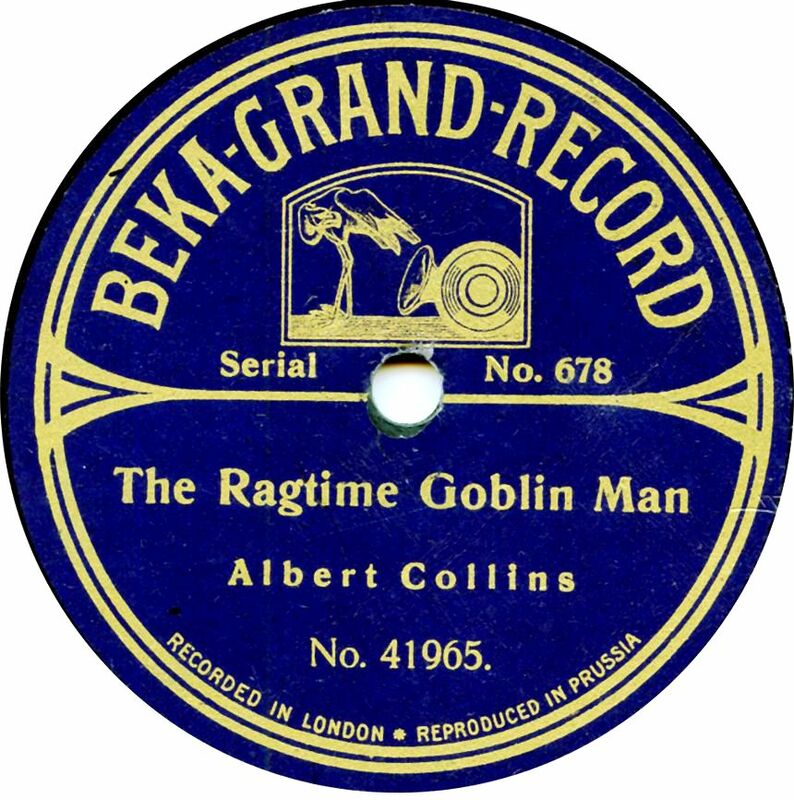 This was a 6½" disc (The only record I have encountered of this size) and was recorded and manufactured by Vocalion in around April 1923. They had a catalogue series in the B-1000 range and I suspect they were pretty short-lived. No artist credit is shown on the label. Another odd thing about this label... I have only seen three of them and all 6 sides had the label name / logo scratched out (see first picture). I can't think of any reason for this. 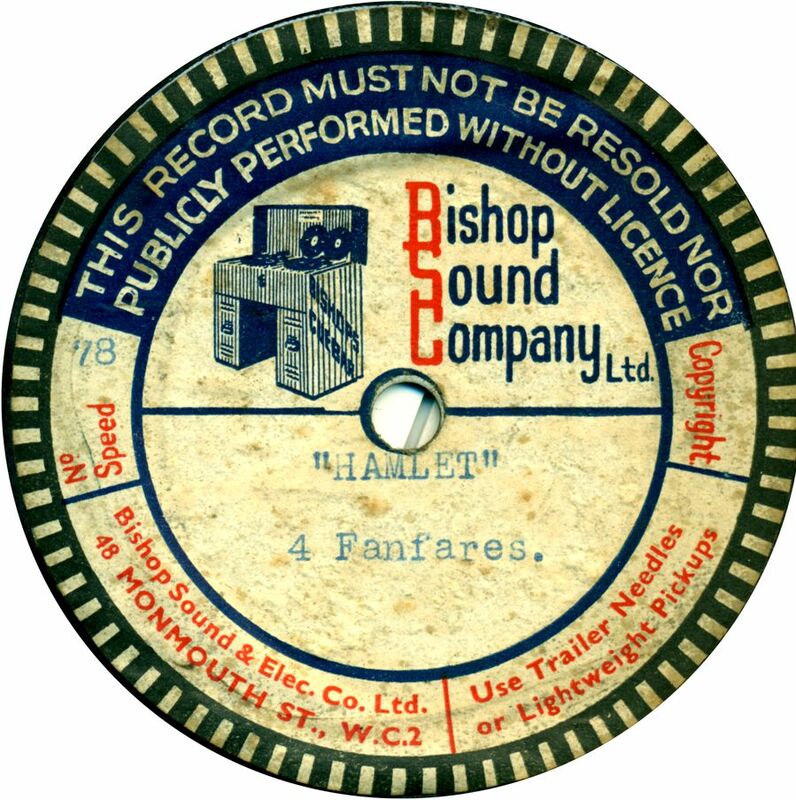 The second picture shows what the label is believed to look like and my thanks are due to Steve Walker and Norman Field for helping to recreate the label. A scan of an undefaced label, or information about other issues would be gratefully received. 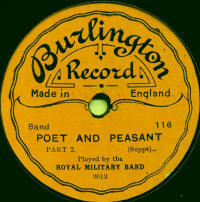 Bosworth Bosworths were a music score publisher and the first records using their name date from WWI. These were pressed by Crystalate using Guardsman masters. They are exceedingly rare and only a couple of examples have so far been found: the one shown here and also No. 4 "Tender Appeal" by F. G. Byford (mx no. 796). (see first image). It is likely that there were only a handful off differnt issues. If you should know of any details of these early records, do email me. 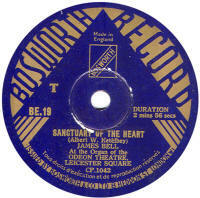 The more familiar Bosworth records were introduced in early 1937. 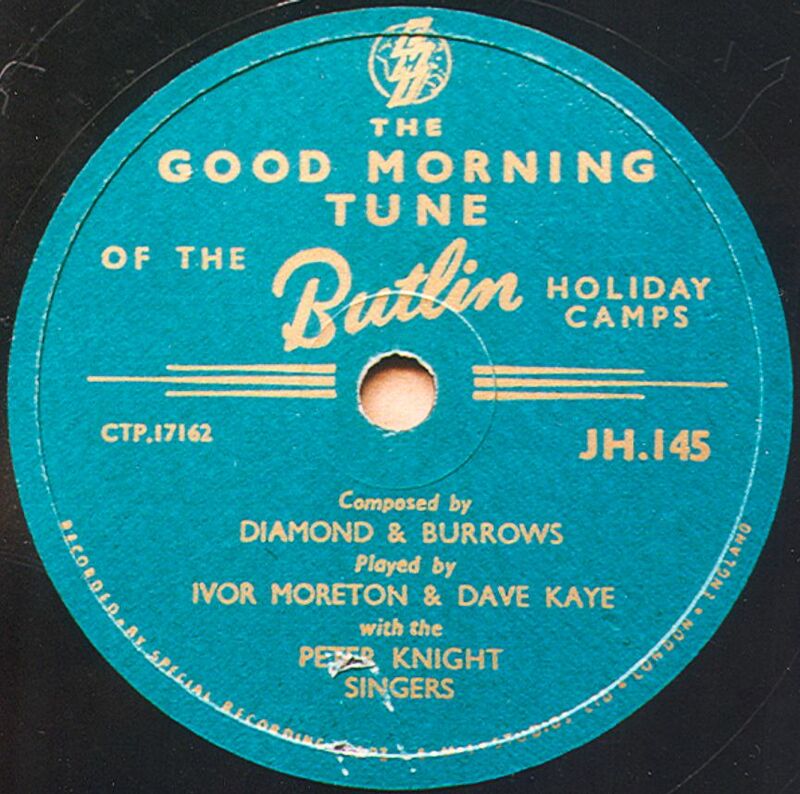 These were recorded and pressed by Decca and contained music from scores owned by Bosworth, mainly what is now termed "Library music"; light music that could be used by radio, film and (later) TV producers as background music. I have anote that the records cost 5/9, but that sounds like a 1950s price. Louis Voss appears to be the main musical director for the orchestral recordings. The catalogue starts at BC-1001 in 1937 ans ran to BC-1239 in 1959, at which point the prefix changed toBCV and the number continued from 1240 onwards to BCV 1531 in 1968. 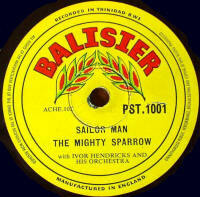 The extra "V" in the prefix may represent the change to pressing 78s from vinyl rather than shellac. 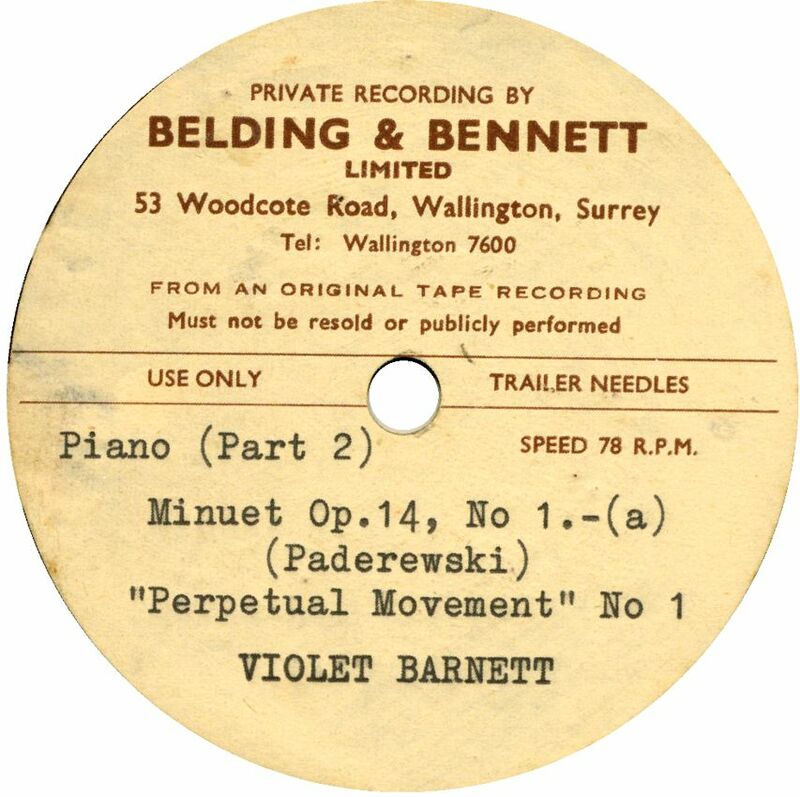 As well as Decca recordings, which used CP- master numbers, EMI also recorded & pressed Bosworth records, using their CPT-matrix series. Thanks to Bill Dean-Myatt for all the label images. Bouwmeester This was a 10" Scala product, made in Britain by the Universal Music Co. (later the Vocalion Co.) for export to the continent, produced for Louis Bouwmeester Jr, who owned a theatre chain in the Netherlands. The records were availablr from Spring 1923. 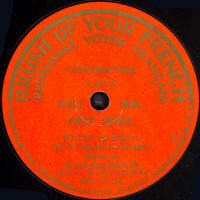 Association A set of recordings produced by EMI, dating from 1926 and 1927. 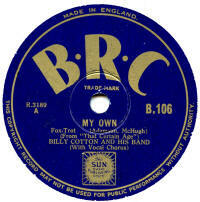 My thanks to Bill Dean-Myatt for providing the label scan. I have had to adjust the brightness and I suspect the label colour would be the usual HMV plum. 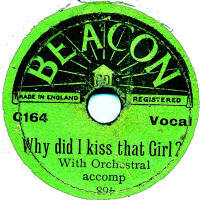 BRC A rather mysterious record produced by Decca and using existing records already issued on their Rex label (in this example). The reason for these issues is currently unknown, as is the extent of the series, and what the name refers to, or stands for. As usual, when such things are unknown, it is assumed they were made for export! My thanks to Charles Hippisley-Cox for providing the label image. Brechnerphone Nothing is known about who manufactured these records, or for whom they were made, but the example seen here uses Beka/Lindstrom masters and actually has the Scala catalogue number in the wax. 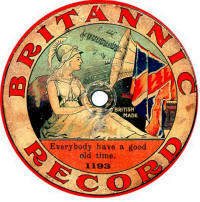 Britannic Britannic records date from about 1910 and there appear to be two distinct styles, as shown. Neither show any maker's name but the first one does say "British Made"; the other proudly proclaims "British Made Throughout". 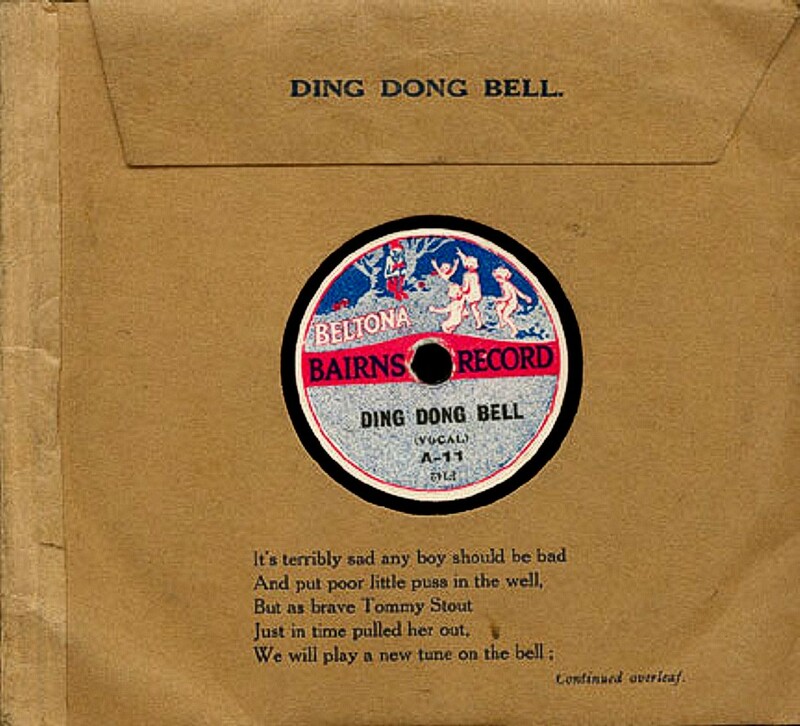 The first example above is a 11½" disc and used "Bell" masters and pressed by Edison Bell, the other is a standard 10" disc and the masters were from various sources, such as Edison Bell, Nicole, Beka and American record Co; the records were pressed by the Disc Record Co. of Harrow. The records cost about 2/6 and were sold by the "tally man" system where the customer was contracted to buy so many discs over a year (about 50) for a fixed price, for which they received a new gramophone. 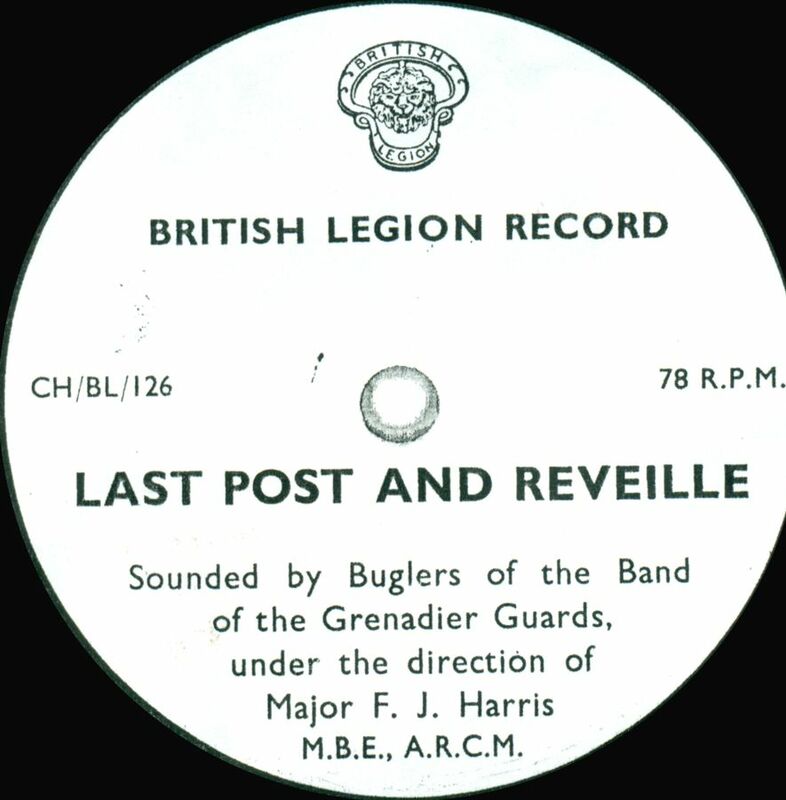 British Legion A specially-produced record, probably a one-off, for the British Legion. 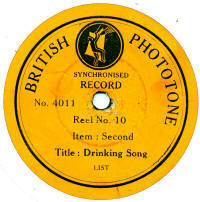 British Phototone These records date from the late 1920s and were produced for use as a soundtrack which would synchronise with a film. Joseph Nussbaum was the musical director. 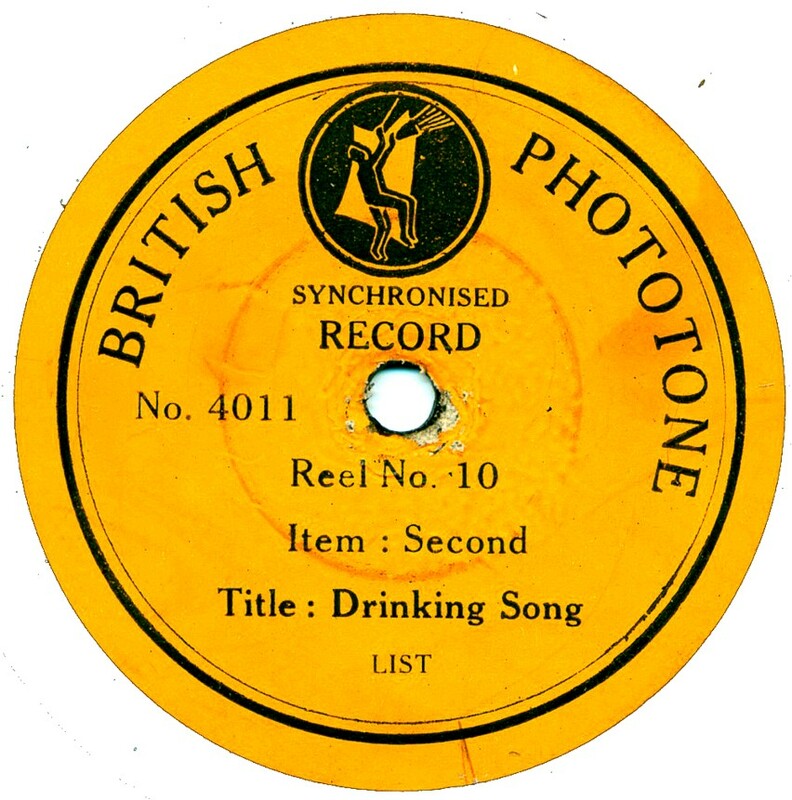 British Polyphon Dating from the WWI period, these records were made for the British Polyphon Company of 1-3, Newman Street, London and 27, Jamaica Street, Glasgow. 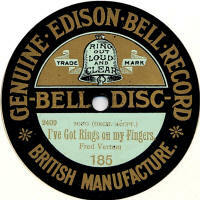 The records used Edison Bell "Winner" masters and numbers were in a P- series catalogue. Information about any of these, or a decent scan would be appreciated. This image seems to be of the only example ever found! Frank Andrews says the reverse side is by Alf Willis. 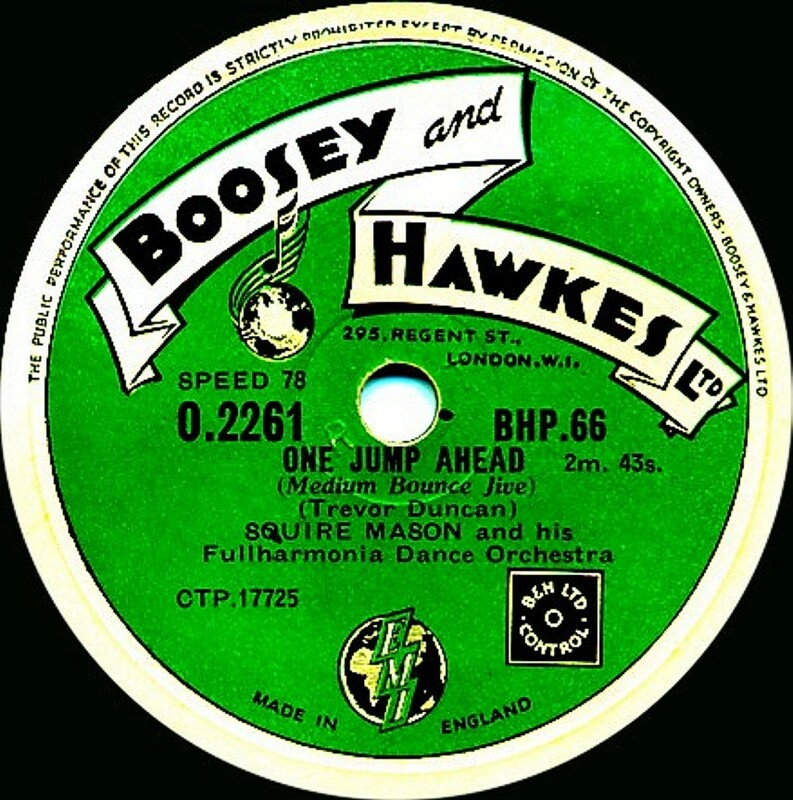 British Sound Recording Association This association was founded in 1936, but known examples of any records appear to date from post-WWII. 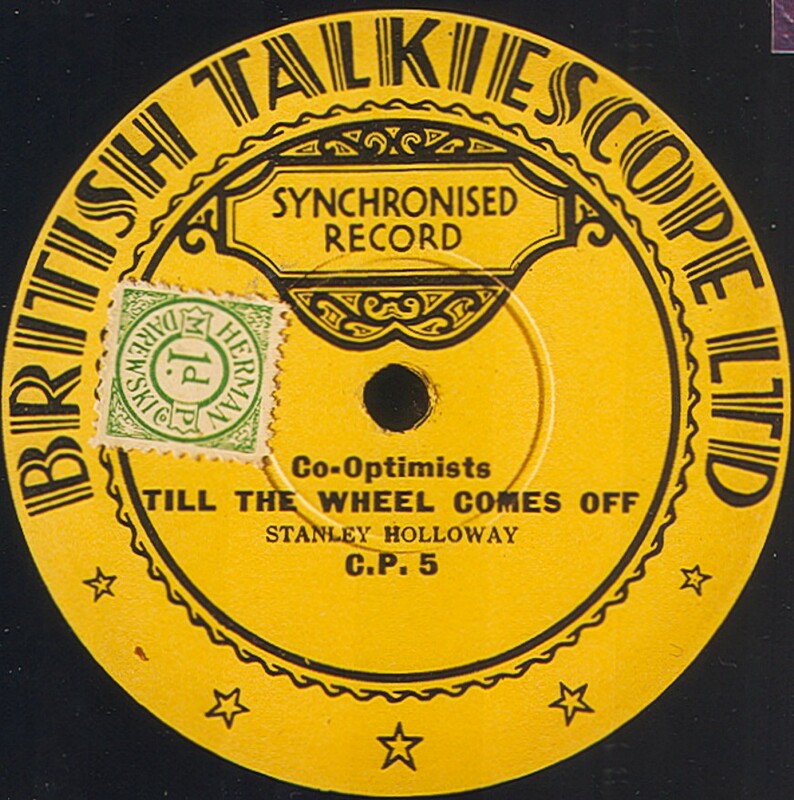 British Talkiescope Obviously an early example of matching sound with film. 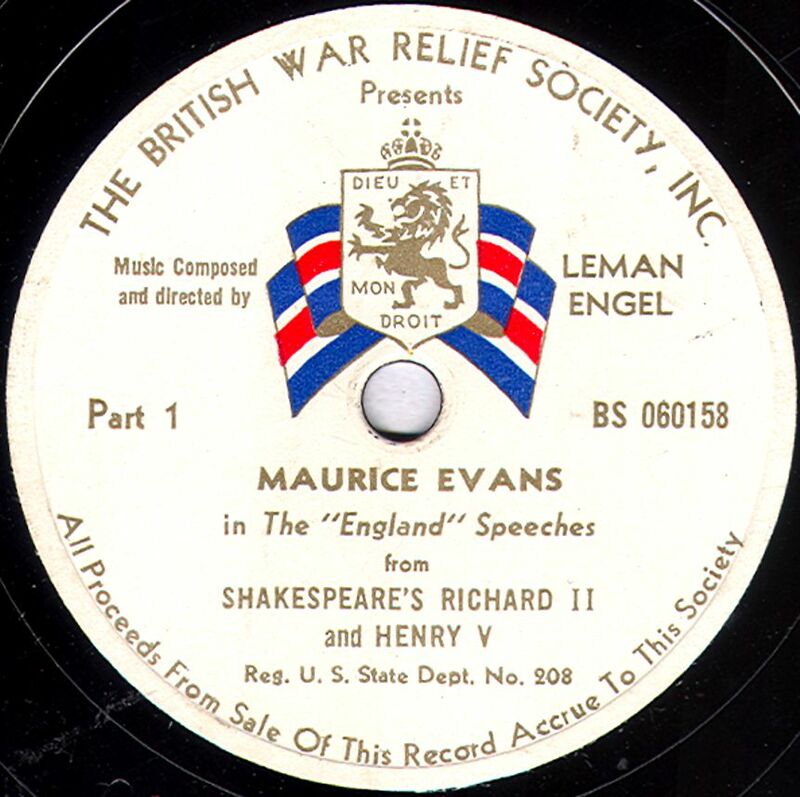 British War Relief A specially-produced record, probably a one-off, pesumably from the second world war. But is it a British label? There's no clue on the label itself. 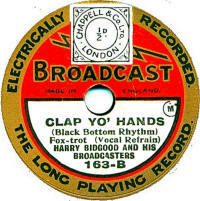 Broadcast Vocalion introduced their popular 8" Broadcast record in 1927 and they sold in their thousands over the next 6 years, increasing in size to 9" in 1931. There were "spin-offs" in the shape of the 6" Broadcast Junior and the various 10" Broadcast 12 series, Broadcast 4-tune and Broadcast International. The name was finally dropped in 1934, by which time Crystalate owned the company. 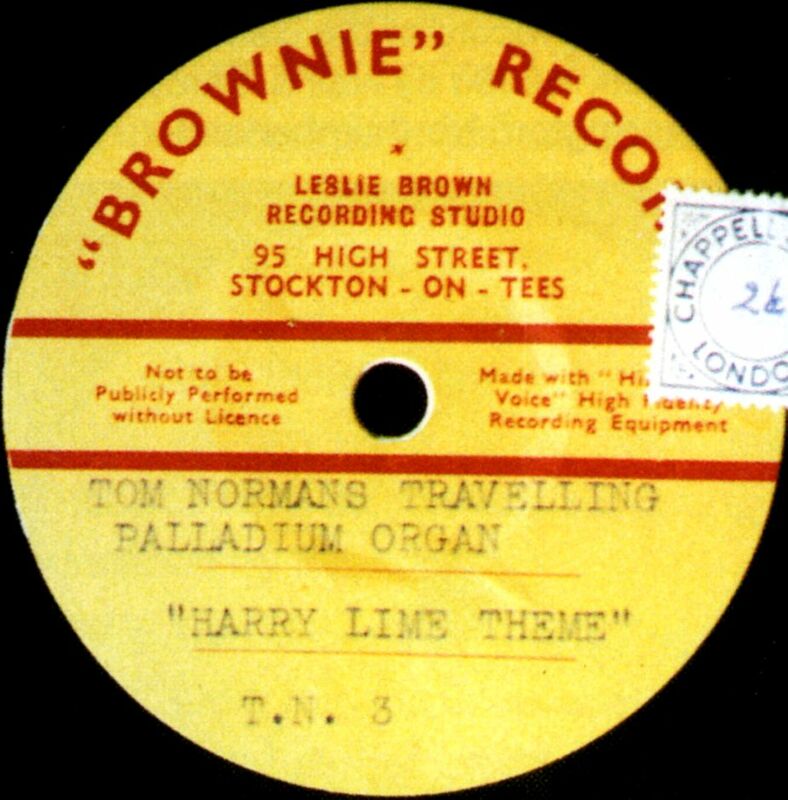 Brownie The example seen look like an acetate, but Ray Stephenson reports that solid stock shellac records do exist, these pressed up by Oriole Ltd. The example here dates from 1953. 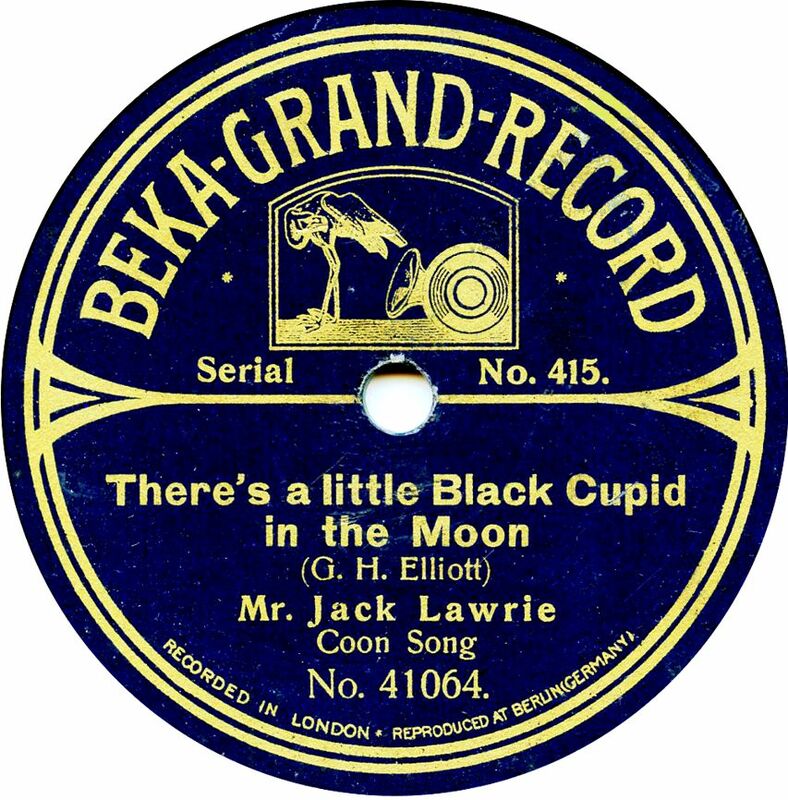 Brunswick Brunswick records were introduced into Britain in 1923; the name was used by the Chappell Piano Company who were music publishers and sellers of the Cliftophone gramophone. The masters were all from American Brunswick initially, and confusingly used a similar catalogue series which sometimes coincided with the American issues, and sometimes didn't. 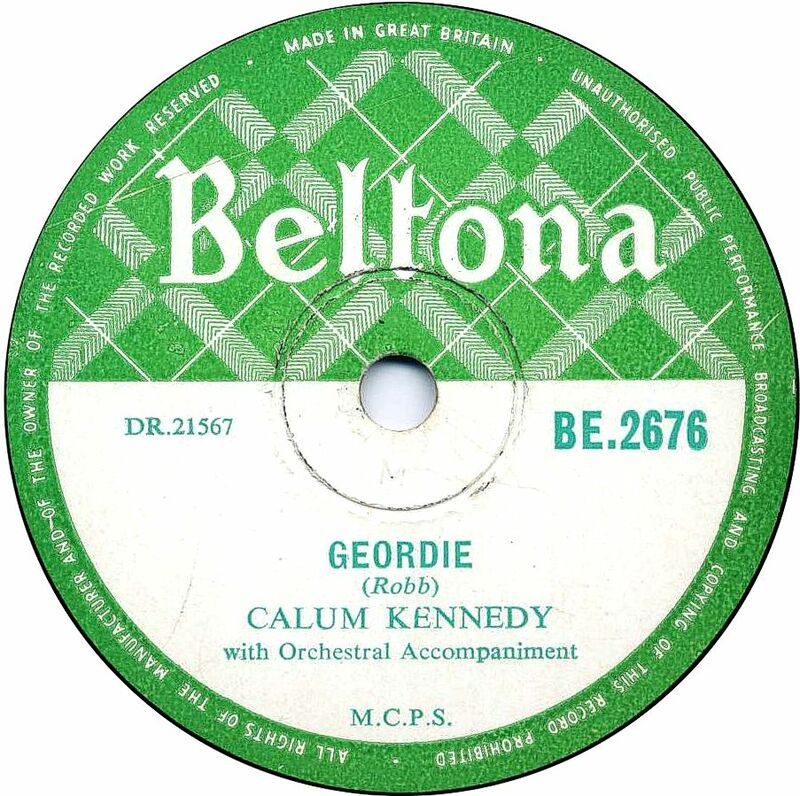 The label was bought by Decca in the 1930s and they continued to use the name until the 1960s. Brush Up Your Language Examples of some series of labels produced for The Linguaphone Institute by The Vocalion Gramophone Company, probably in the early 1930s. A very rare British label available from 1915 until 1920, and manufactured by Crystalate. 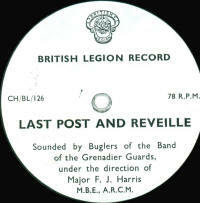 The records cost 1/6 initially, but increased to 2/6 towards the end of WWI. there are several different label designs including the rather (by then) old-fashioned etched-and-filled labelling. 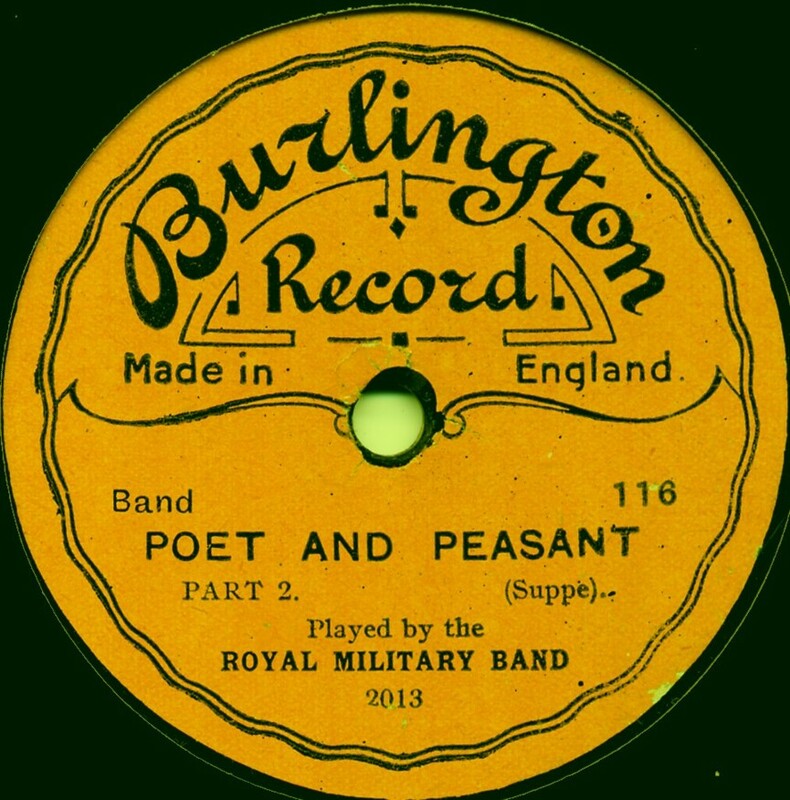 Burlington One of the many obscure labels from the first world war period, Burlington drew on various sources for their masters, including Nicole records and J. Blum & Co. 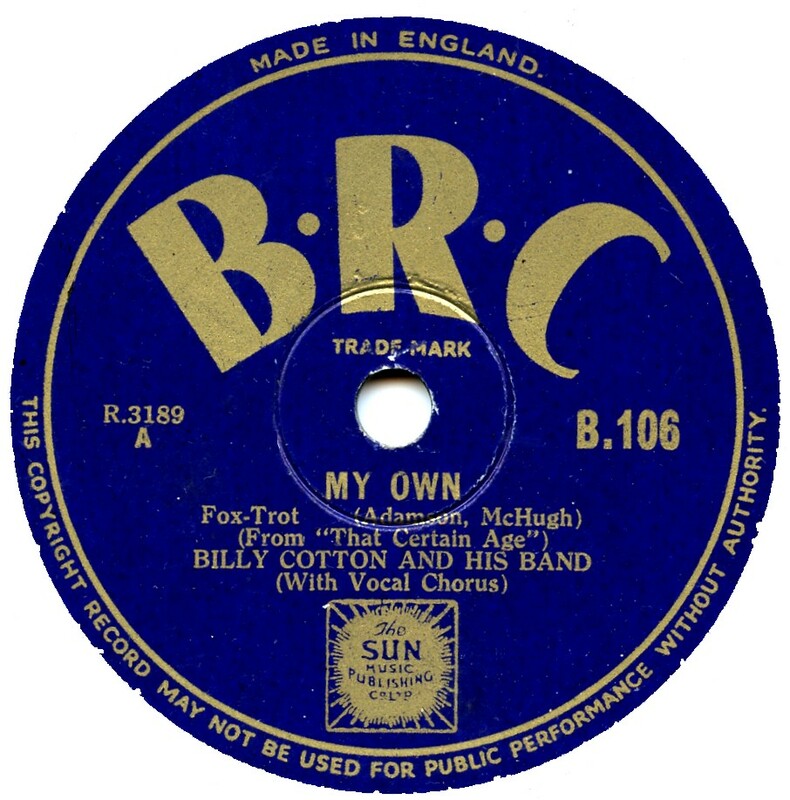 The records were manufactured by The Disc Record Company of Rosslyn Crescent, Harrow, but it is not known for hom they were made. 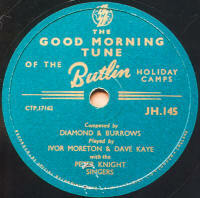 Butlins Some examples of record produced specially for Butlin's Holiday Camps. 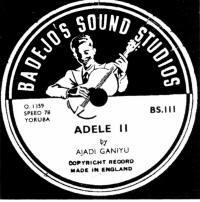 The first one was recorded & pressed by EMI. Butterfly There are two different forms of Butterfly record. One was an oversized 10" disc using pre-WWI Grammavox masters. The label was dark red with a gold butterfly and used a B-1 catalogue series, running possibly as far as B-300. This is the first example shown here. Thanks to Mike Jones for the label scan. 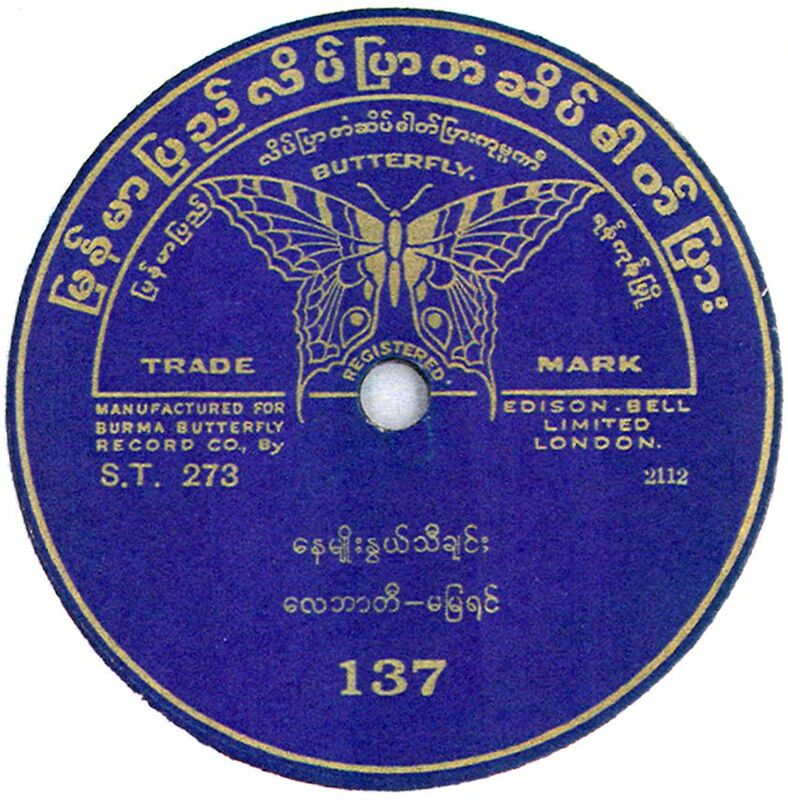 The other version of Butterfly was a total or partial paste-over label used on old stocks of "Popular", "Imperial" or "Mimosa" records, presumably as a way of disposing of them cheaply (see second & third scans). 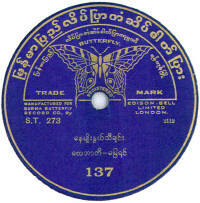 Butterfly This was a separate "Butterfly" label from the above, and was manufactured by Edison Bell for export to Burma, presumably in the late 1920s or very early 1930s. 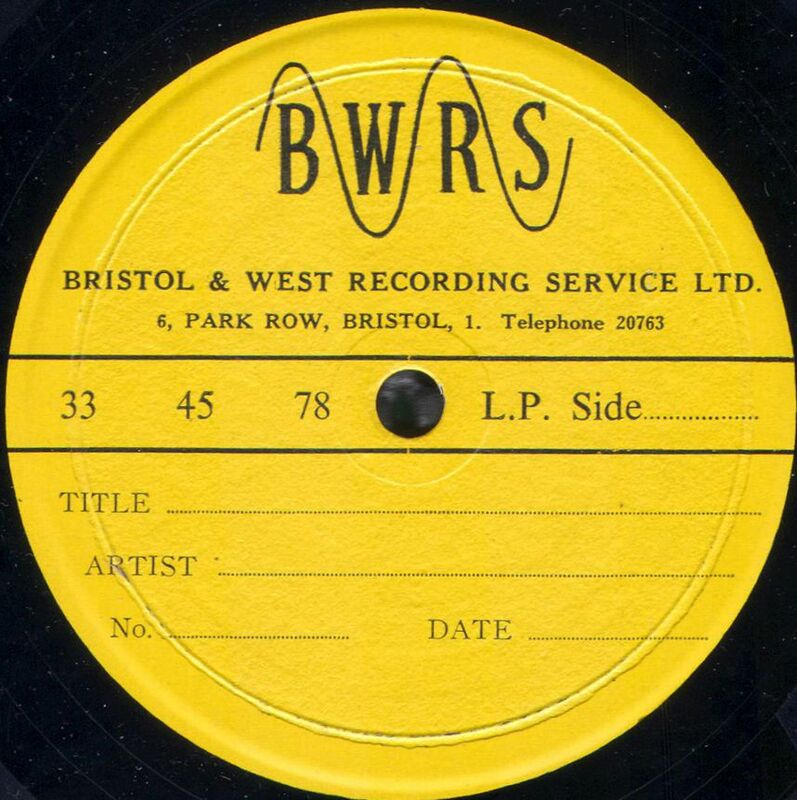 BWRS The Bristol & West Recording Service Ltd was a private recording company operating in Bristol.